After learning how areas to be studied are decided, organized and surveyed, I wanted to see what happens after the data is collected. 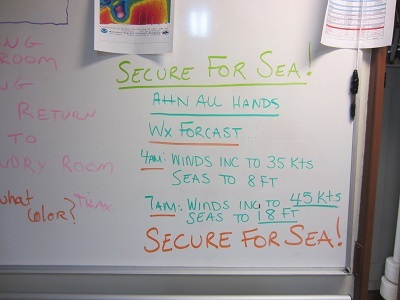 I spent some time in the Plotting room with NOAA visiting physical scientist Adam Argento. 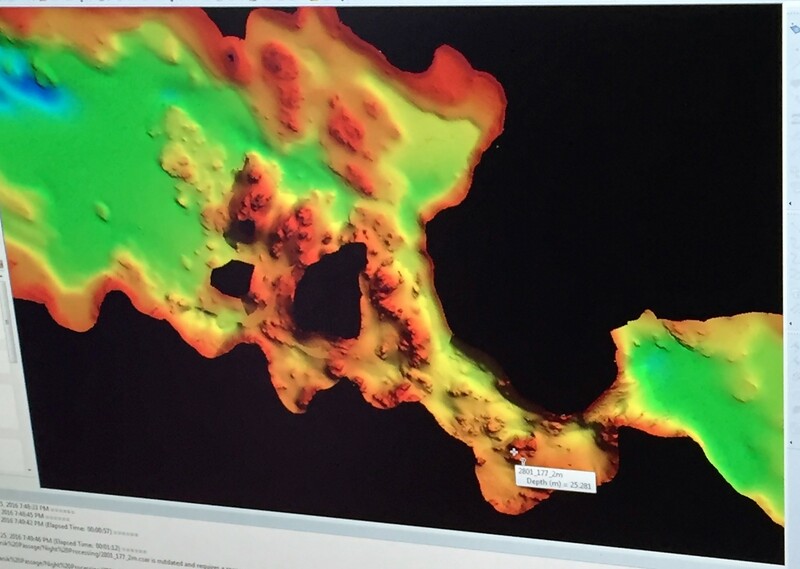 Adam instructed me on hydrographic research and what is involved with completing their work. Needless to say, using the term “blowing my mind” is very appropriate here. Sitting with Adam and discussing the work that is accomplished was great. He even made me think of space – and you know how much I love a space tie-in!! While we were talking about the data that would be collected we began speaking of how do researchers know where the ship is? You might automatically think of GPS (Global Positioning Systems). We have them on our phones, in our cars and other forms of technology to help us find our way home, but the GPS systems we use are not as accurate as NOAA needs. On Rainier they need to know exactly where they are!! Just like when we give you rules you need to follow in doing your work, the researchers here have very limited parameters for creating/updating their charts for safety. While collecting data they want to make sure that the charts are as accurate as they can make them. If the data collected is off just a bit, there could be a dangerous situation. The people updating the charts work very hard to create high quality and safe charts. A satellite GPS receiver on one of the launches. Adam showed me some of the satellite receivers on the ship and launches. We couldn’t reach the Rainier receivers, but see the picture of a receiver on a launch, they are much smaller than I imagined. Each launch has two receivers at least six feet apart. They are needed for the satellites to know which direction the launch is going in. The satellites use the smallest of time measurements sent down and received back between the two, but it works! Adam Argento at his computer in the Plot room. Another question… how do the satellites know where they are? We can’t use a marker on the Earth reliably, or to the level that NOAA needs, because our planet is constantly moving (think tectonic plates and earthquakes). Are you ready? Adam told me satellites use pulsing QUASARS that are far out in space to know exactly where they are!!! 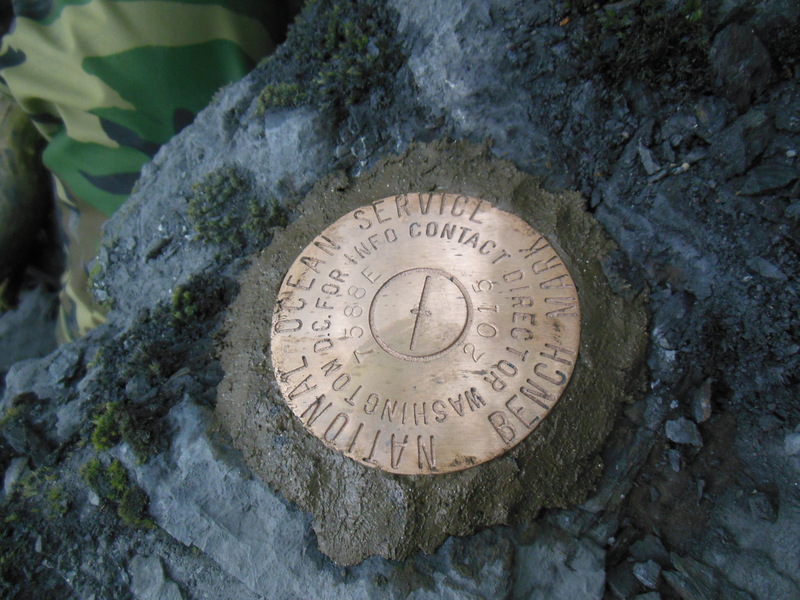 (In case you were wondering, this is the part where my mind was blown, I thought they used land based markers). Like I mentioned earlier, the CARIS program takes all of the data, including changes in the Earth’s Ionosphere and differences in the ocean water due to CDT (conductivity, depth and temperature) and puts it together to create a working document or chart. This is a lot of information that needs to be controlled. 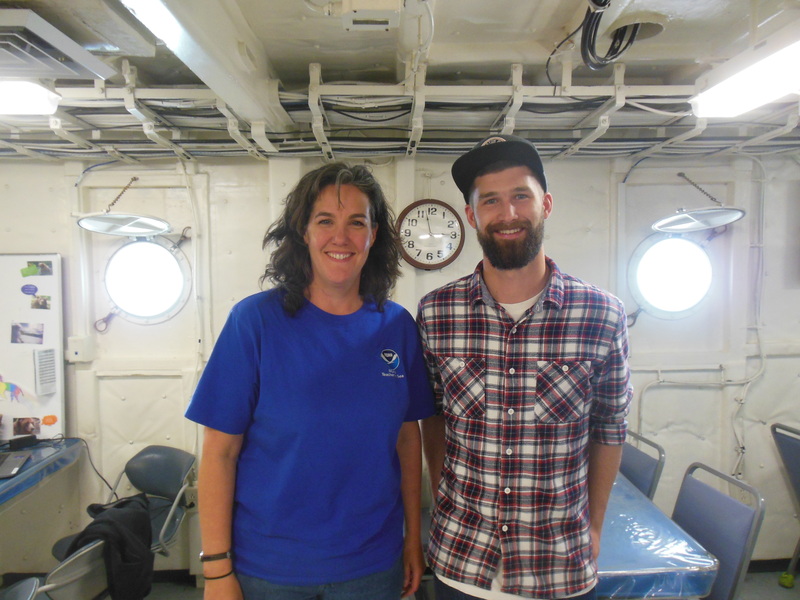 Adam works for NOAA in Seattle so he will be part of the team taking the data and putting it into more accurate charts once he gets back on land. A pretty cool job if you ask me!! To continue sharing some of the fascinating people on Rainier, I sat down with Rainier General Vessel Assistant (GVA) Carl Stedman to learn how he came to work here. Carl started his career in the Army and retired after 20 yrs. Incredibly, after proudly serving our country for so long, he then went to college and earned a bachelor’s degree in finance from San Francisco State. About half way through earning his MBA (Masters of Business Administration) he decided to take some time off. He rode his motorcycle around the US for three months. Realizing wearing a suit or working in a cubicle would not make him happy, he moved to Virginia and opened his own coffee shop for three years where he met his wife. He then worked as a patient service manager in Norfolk hospital. With more introspection he thought back to his time in the Army. After having lived in Germany and serving in other areas of the world for a long time, he remembered his time on an Army ship for the last 7 years of his Army career and how much he enjoyed it. He then applied to work for NOAA and was put on Rainier. 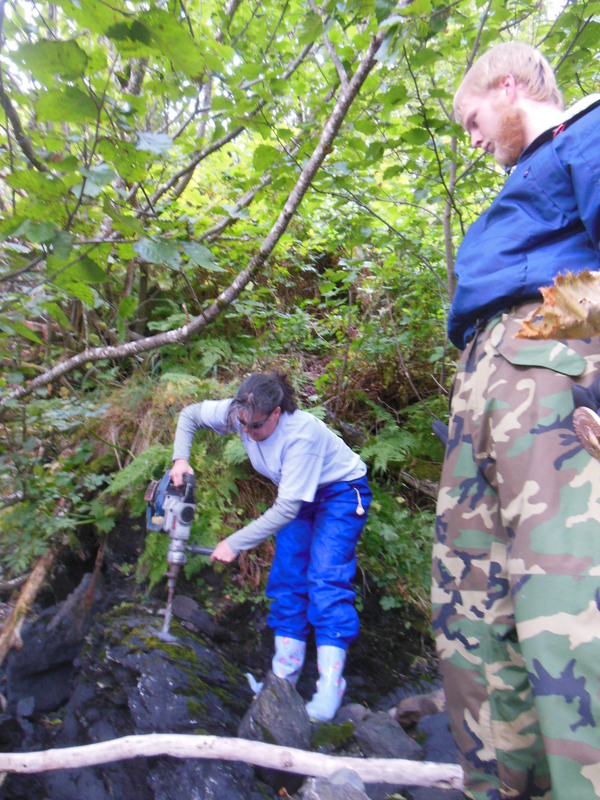 On Rainier, Carl has some very interesting jobs!! Along with the very busy job as a GVA, Carl is also an Advanced Firefighter and is on the first response team (he was also in his firefighter outfit when we had drills, but I did not get a picture of him). He is an MPIC (Medical Person In Charge) which is like an EMT that we have on land. Another job he has (and one that makes me nervous just thinking about it) is as a Confined Space Rescuer. Yikes… he clearly does not have claustrophobia!! Another exciting job he has is the driver for the fast rescue boat that is on Rainier. Carl is another unique person on this incredible ship and I feel very safe knowing he is around. Thank you, Carl, for taking the time to chat with me and show me so much!!! This wonderful crew has been teaching me a great deal about this ship. One day, acting Boatswain (pronounced Bo-son) Jason Kinyon took time to teach me how to work the two smaller cranes on the bow of the ship. He had me move a filled bucket of water to different areas on the bow WITHOUT SPILLING ANY OF IT!! I really liked it!!! The most challenging part was when he sat down right next to where I had to place my bucket of water. I did not want to get the deck boss wet and I didn’t! I did spill a little bit on one of the hatches though. Jason was very patient showing me all the tricks to moving the crane! Bring on the big aft crane next!!!! 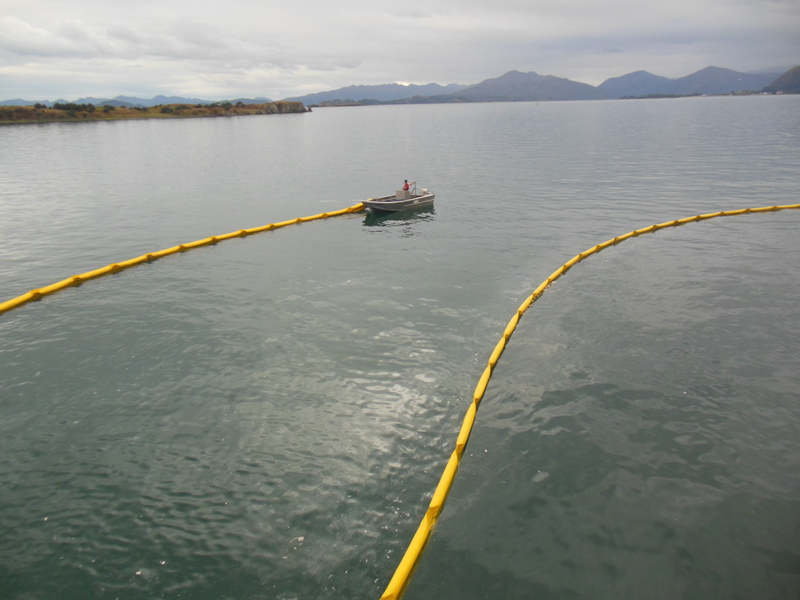 When we went to the fuel pier in Kodiak I was able to throw the “heave line” that goes up to the dock and is then knotted around the bigger mooring lines so they can be pulled up to the pier. I feel the need to add that three big, strong deck crew who were back in the fantail of the ship with me missed where they had to throw their lines. GVA Carl Stedman was very reassuring to me and I got the line where it had to go. Everyone on the ship was talking about how I made it on the first try when the seasoned crew did not. 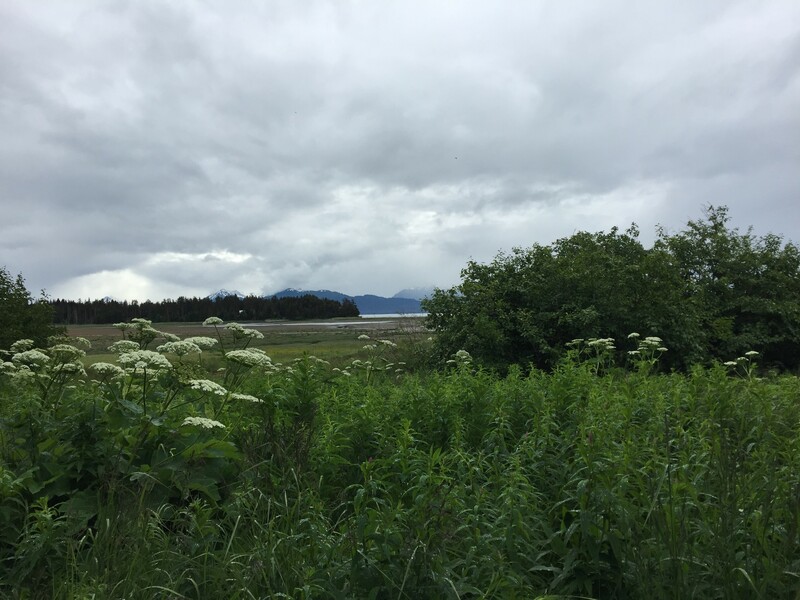 In case you are wondering, yes, that is a cruise ship in the distance at the Kodiak public dock. To name just a few more things, I have been shown lots about navigation, I have also driven the launch, worked the davits that raise and lower the launches, learned about the anchor and basically anything else I can learn about and what people are able to teach me. Thank you, again, to everyone for teaching the teacher so I can share this amazing experience with others!! Learning to lower the launches. Here, I already put the launch in the water. As I mentioned earlier, safety is top priority here on Rainier. 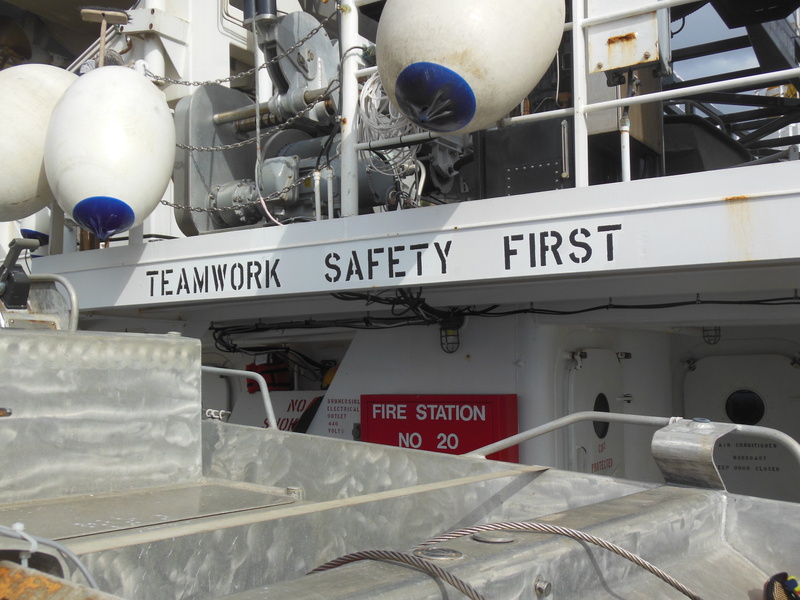 The crew is required to have safety drills within 24 hours of leaving port. 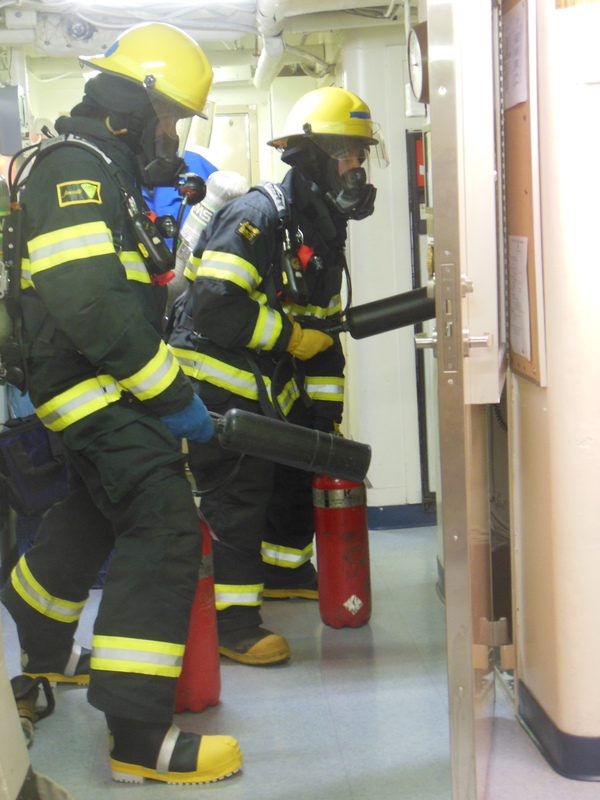 This includes drills such as Fire and Emergency drills, Man Over Board (MOB) drills and Abandon Ship drills. 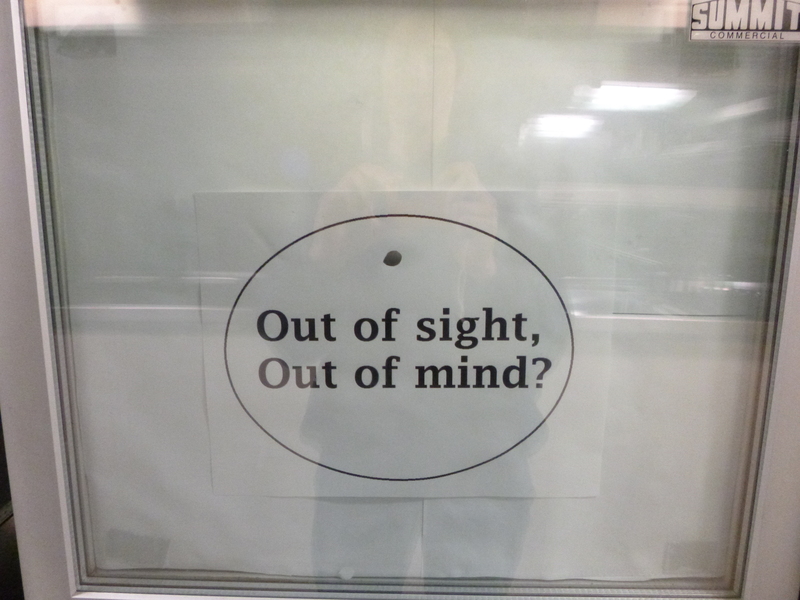 When I arrived I was quickly told how to find 2 ways out of my cabin. My cabin also has a device called an EEBD – Emergency Escape Breathing Device that will allow me to breathe for 10 minutes in a smoky corridor if needed. 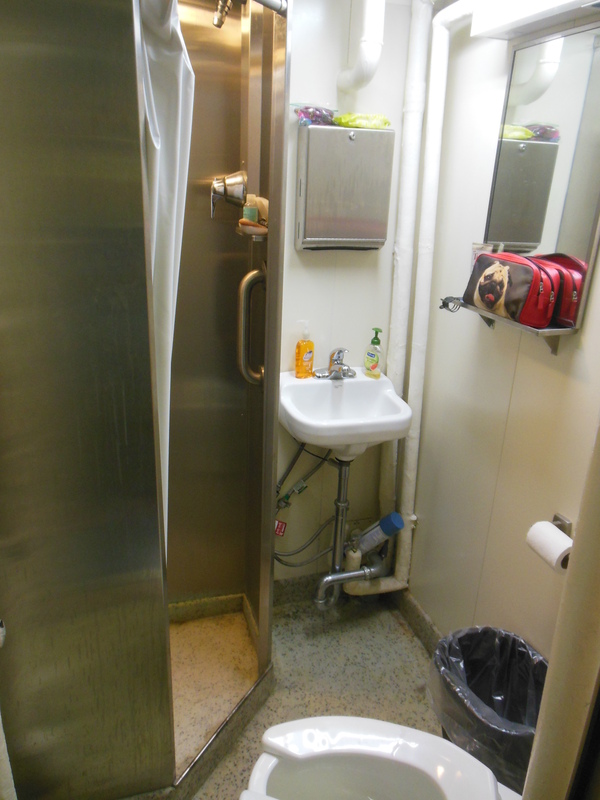 Each and every cabin has these and they are also in various places around the ship. All new crew and visitors are given a thorough safety briefing before we leave port. We started by doing some paperwork and discussing what everything means. Then, ENS Danial Palance took us around the ship and showed us the important areas. He made sure I could find my safe places to report to since I am so new to the ship. Every person, including me, has a job during an emergency. Each person is given a “bunk card” that is held near your sleeping bunk. It lists the three main emergencies we practice and where each person reports to. This will definitely get your attention! If it is a drill it will be announced. If not, it will say this is an emergency. My job is to get to the “BRAVO station” which is on the Fantail or back of the ship near the boat shop. My primary duty is to “assist as directed” if help is needed. All over the ship are stations for the firefighters. What I find most interesting is these are not people they bring on board specifically… it is the crew you see around you who have also trained to be Firefighters and Advanced Firefighters! ENS Palance is one of them! The fire station in the mess hall. 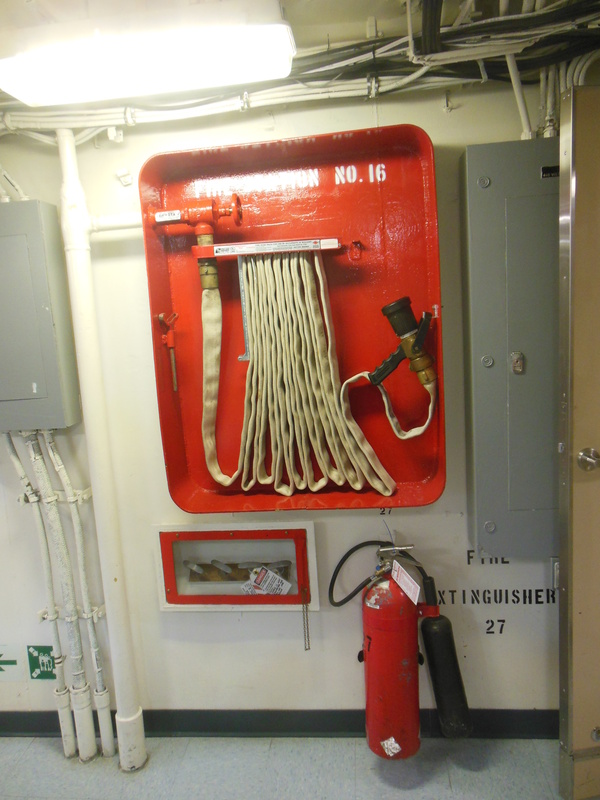 Also throughout the ship you can see Fire Stations and fire extinguishers, fire alarm boxes, radios for communication. Some of the areas with more dangerous items (like paint or the machine shop) are labeled “CO2 PROTECTED SPACE”. I was most curious about this. What do you think CO2 and fires have in common? If you answered that fires need oxygen to burn and CO2 will put a fire out then you are correct. In one area of the ship there are many large canisters with CO2 in them. If there is a bad fire in one of the CO2 protected spaces, someone can send the CO2 to that area and put the fire out. It will remove all the oxygen from the space. 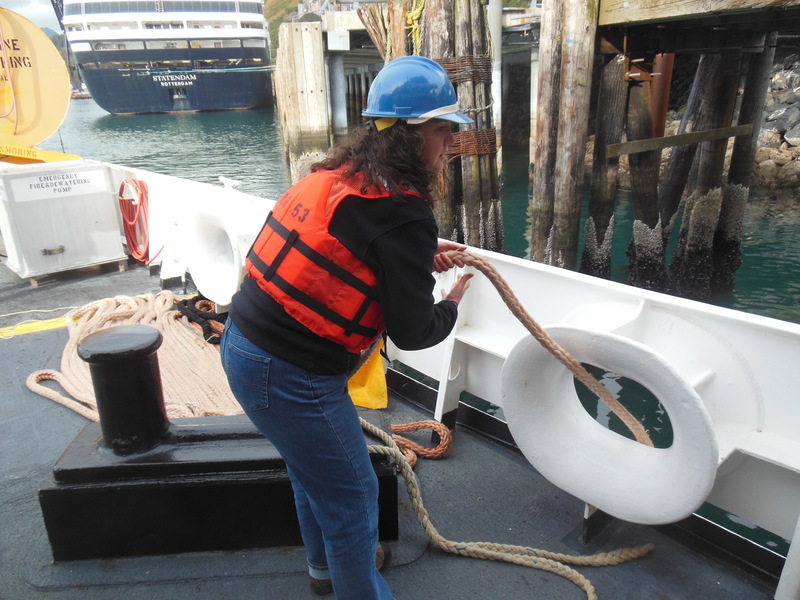 Man Over Board drills – On a ship if someone falls into the water you will hear the whistle blow for 3 long blasts. Along with many other orange safety rings, this one has smoke attached to it. If you are the person who saw this, you will need to keep your eye on the person and let others know. Everyone has a station for this as well. My job is to report to the “Flying bridge” on top of the ship and be a lookout and help as needed. 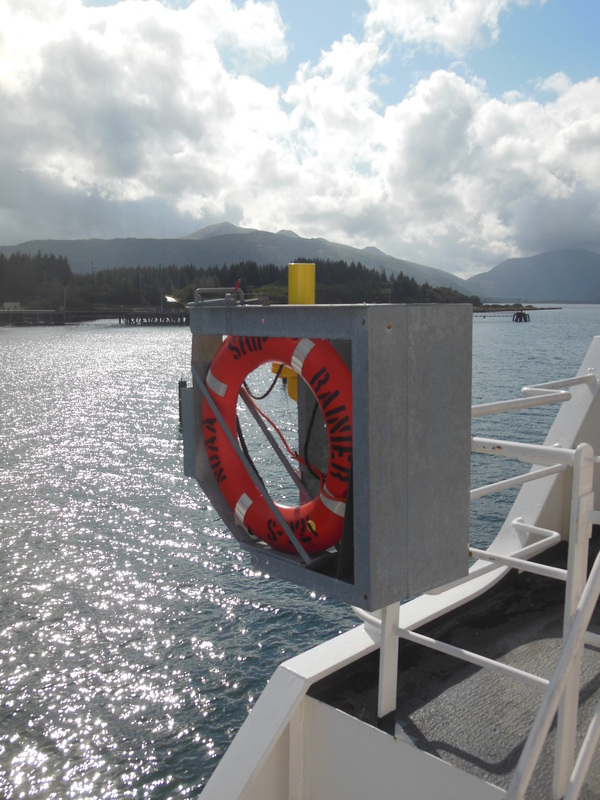 The ship has many orange safety rings that can be throw overboard to someone. There are also two rings with smoke signals attached that can be released from both port (left side) and starboard (right side) of the ship. We learned how to release those as well. Rainier has to do monthly drills for MOB. They don’t actually put someone in the water for this, it is usually a buoy or it could be “Oscar” the medical mannequin (He must be Rainier’s version of “Buster” from the show Mythbusters). 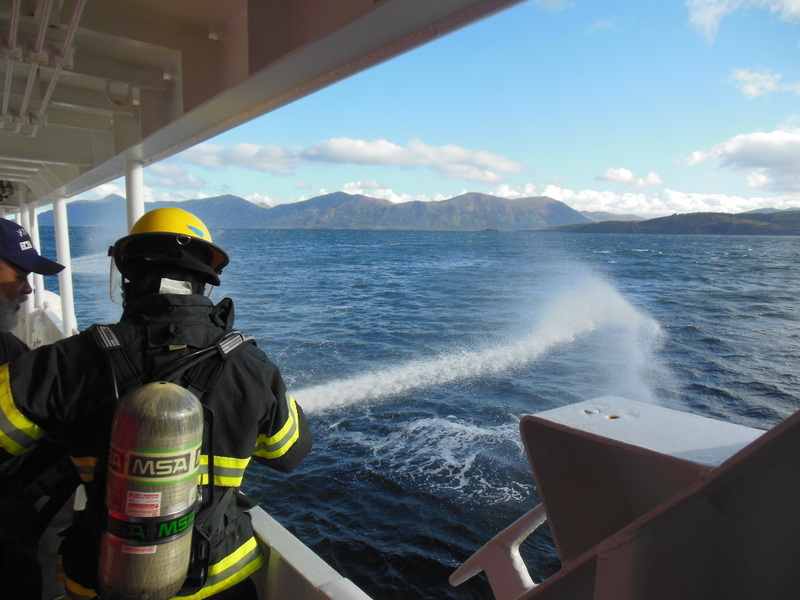 Abandon Ship drills – Being out on the cold waters of Alaska and leaving this ship is a scary thought, but it needs to be practiced. 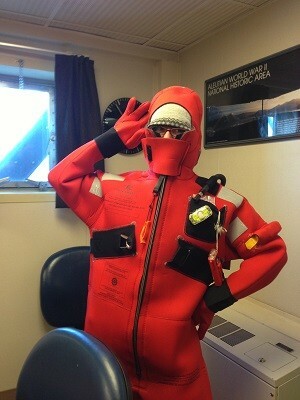 Everyone has their own Survival Suits to wear for these drills. Check me out with mine!! We also need to bring long sleeved shirts, warm hats and flotation devices with us. I will be reporting to Liferaft #4 on the port side of the ship with Liferaft #3 on the starboard side as back up. My indoor meeting place is in the Wardroom and, again, I assist as directed. If we have to leave the ship, people have jobs to go get the EPIRB which is an Emergency Position Indicating Radio Beacon, the SART is a Search and Rescue Transponder and the GMDSS which are Global Maritime Distress Safety Signal. 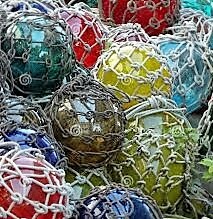 All of these will help the Coast Guard rescue us!! I have had my training, and you know what needs to be done. Now, time for the real drills at sea!!! Suddenly, we hear a long 10 second whistle… it was the drill for fire and emergency. Everyone quickly went to their assigned areas. There was a fire near the mess hall and the fire team was on the job!! ENS McKay and AB Wright worked on putting the fire out. Below are some pictures of them in their fire gear! ENS McKay practicing with the fire hoses. AB Wright and ENS McKay practicing fighting the fire with all their gear on. The fire drill turned into an Abandoned Ship drill. 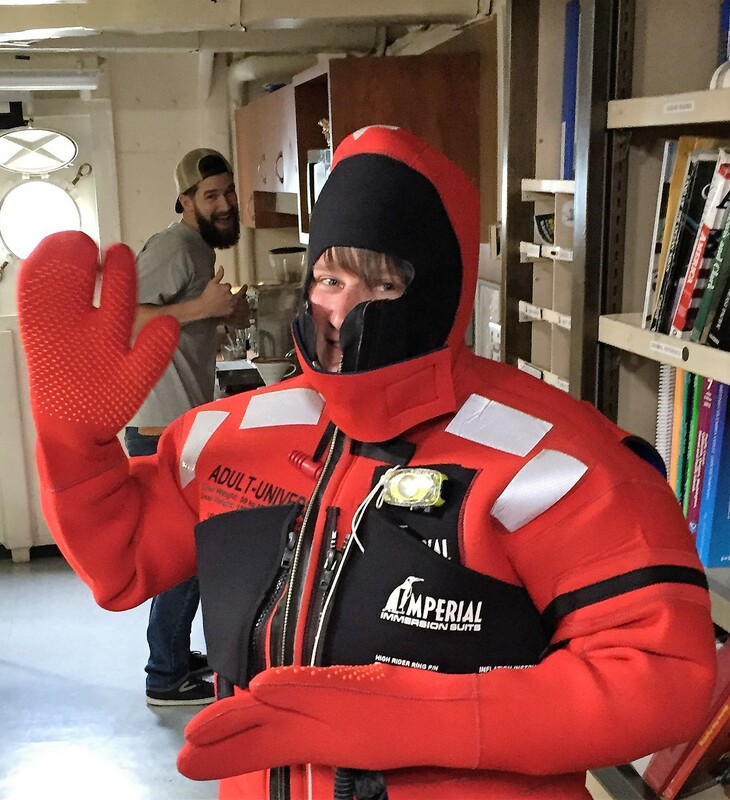 Calmly and quickly, everyone gathered their survival suits, a warm hat, long sleeved shirt and their PFD (personal floatation device) and went to their station. Everyone had to put their survival suits on. ENS McKay was my group leader and he had to help me with mine. He was incredibly fast putting his on and gave me some great pointers on being quicker in a real emergency. While safety drills are important. 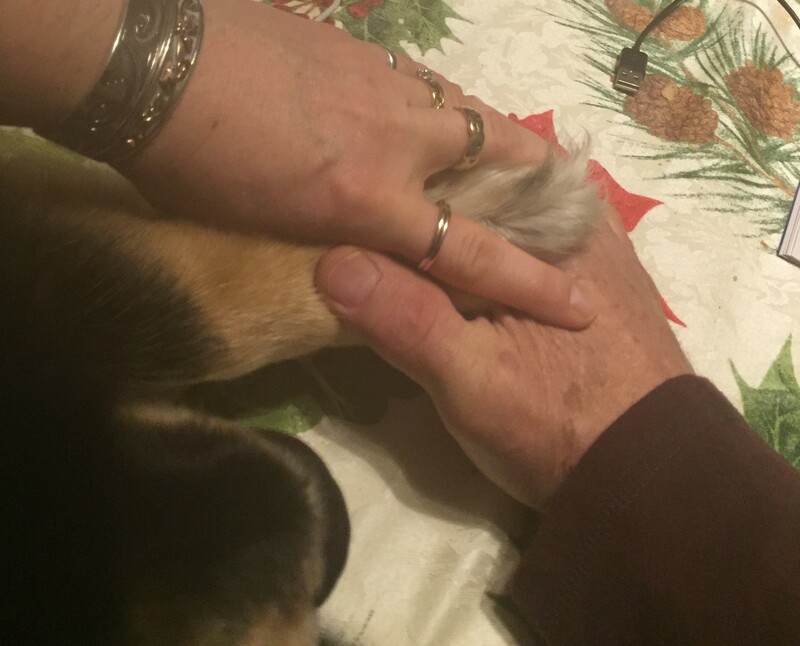 I hope we will never have to do this for real! This crew is truly an incredible bunch. I thought it would be interesting for others to see how people ended up working here. While I would like to highlight everyone, I could only pick a few. The first person I want everyone to meet is Able Seaman (AB) Lindsey Houska. 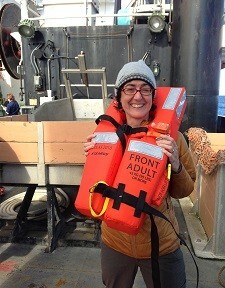 Lindsey is one of the deck hands on Rainier. I wanted to know what path led her to this unique work place. Lindsey started with a degree in Economics from South Dakota State University and worked in Montana for the USDA (U.S Department of Agriculture) for 4 1/2 years. She realized she wanted to get a bit more out of life than working at a desk. She sold her house and car, stored her belongings with her parents and went to Indonesia to volunteer instructing farmers on better growing practices. This was the beginning of her life adventures! After 3 months living in Indonesia and 5 months traveling other areas of Southeast Asia, she headed out to Australia. This incredibly hard working woman did a few jobs but ended up working on a commercial fishing vessel catching prawns on the West Coast of Australia. Later, she got a job in Seattle and South East Alaska as a deck hand on a luxury yacht. Realizing she had a love of positive environmental practices she wanted to do more for the world in general. This is when Lindsey applied to work for NOAA. NOAA are true stewards of the ocean! 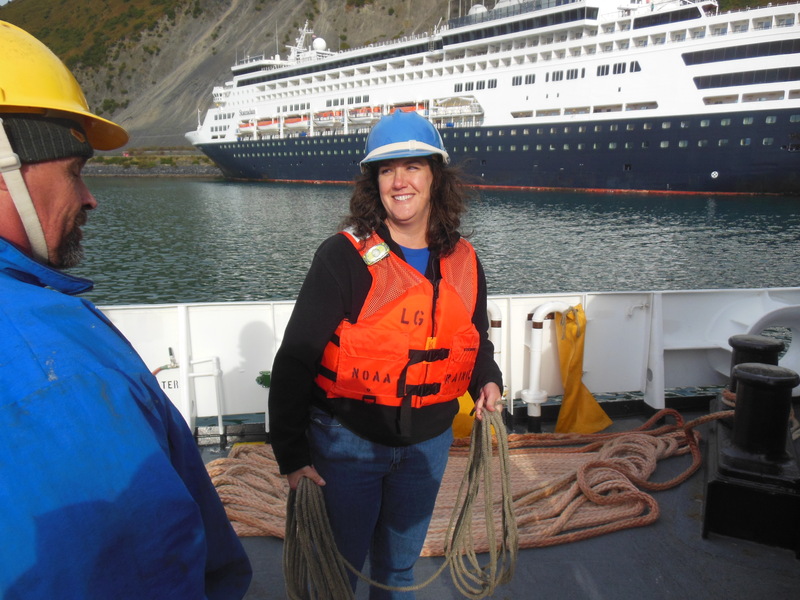 On Rainier, Lindsey has been a very busy deck hand for nearly 2 years. She loves working with all the other deck hands and they have an amazing camaraderie with each other. I learned so much more about her job when we sat down together. Lindsey is a trained fire fighter, has been to radar school and even has her captain’s license for smaller vessels. 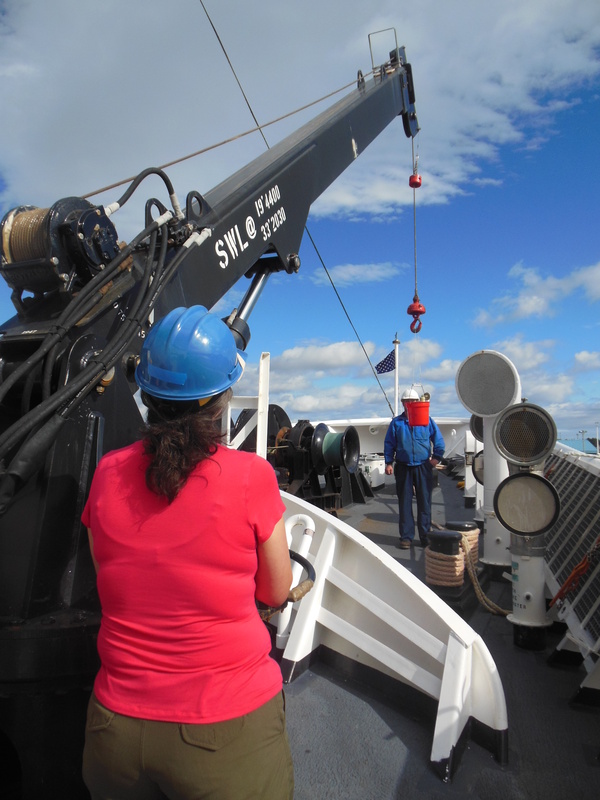 She works hard with boat deployment, maintenance on the weather deck, inport bridge watch for security and anchor watch so the ship stays in place when it is at anchor. She also works the cranes, does lookout on the flying bridge and can be a helmsman steering the ship. In her free time, Lindsey can be found reading, working out in the gym on board, meditating for some quiet time and she also has a bicycle on board that she likes to ride when the ship is in port. When I asked Lindsey what she did to reduce stress on the job, she said having a good sense of humor with colleagues goes a long way. They also enjoy time in port together and having meals together. This amazing woman has traveled all over the world including most of Southeast Asia, all over Australia and New Zealand. She has been to Europe, Mexico, British Columbia and Manitoba, Canada. Incredibly, but not surprising as I get to know her, many of the areas Lindsey backpacked to on her own! I am truly impressed by this lady; how hard she works and how kind she has been to me. Thank you, Lindsey, for letting me get to know you better! TEAMWORK SAFETY FIRST Three words that I have discovered run Rainier. 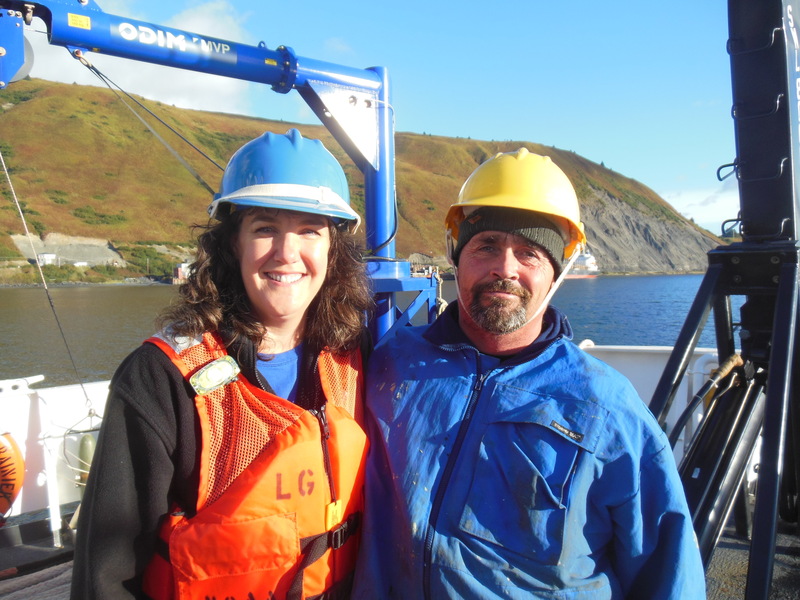 I am incredibly impressed by the teamwork, communication, hard work and commitment to our oceans that is evident here. The umbrella over all of this is an even bigger obligation to safety. 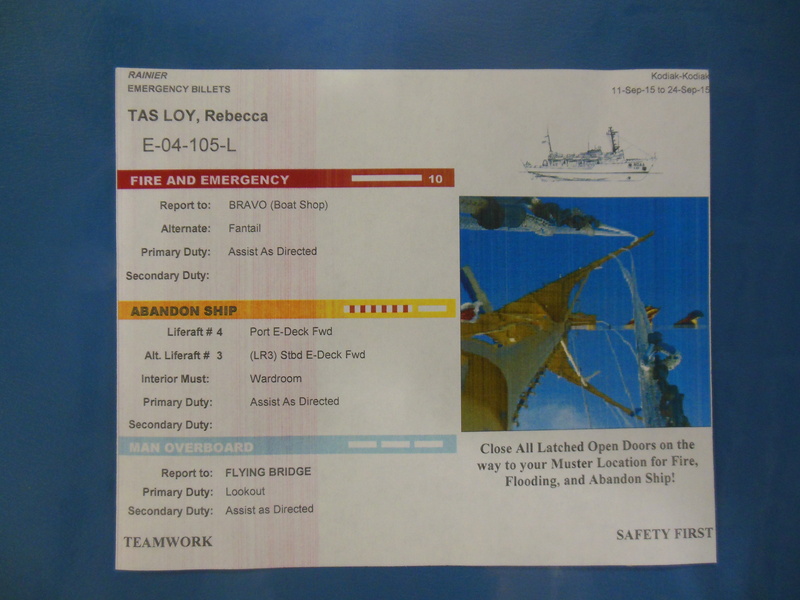 Above I have highlighted just a bit of what makes this ship work in regard to safety. In future blogs you will read more about this topic when you learn about the people here. Needless to say, even though we will be out in very big, deep waters and in narrow bays with tall mountains, I feel incredibly safe in the hands of this reliable crew. Even getting fuel, this team is safe. Here a fuel boom went around the ship. Weather from the Bridge: 8.4o C (dry bulb), Wind 9 knots @ 59o, overcast, light fog, 1-2′ swell. Much like the the lab reports we do in class, hydrographers have a tremendous amount of work to do prior to going into the field. 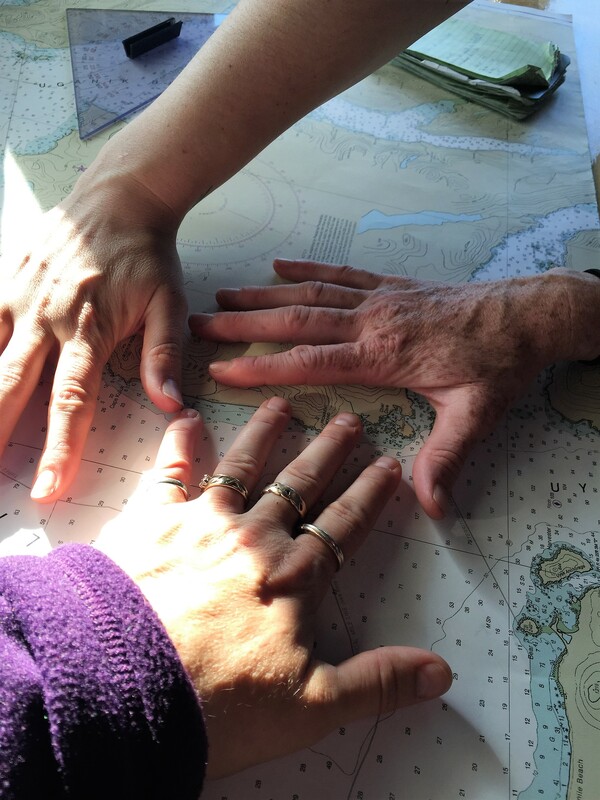 As we make the transit from Rainier’s home port of Newport to our charting location of Kodiak Island, hydrographers are working long hours in the plotting room planning their season’s work. 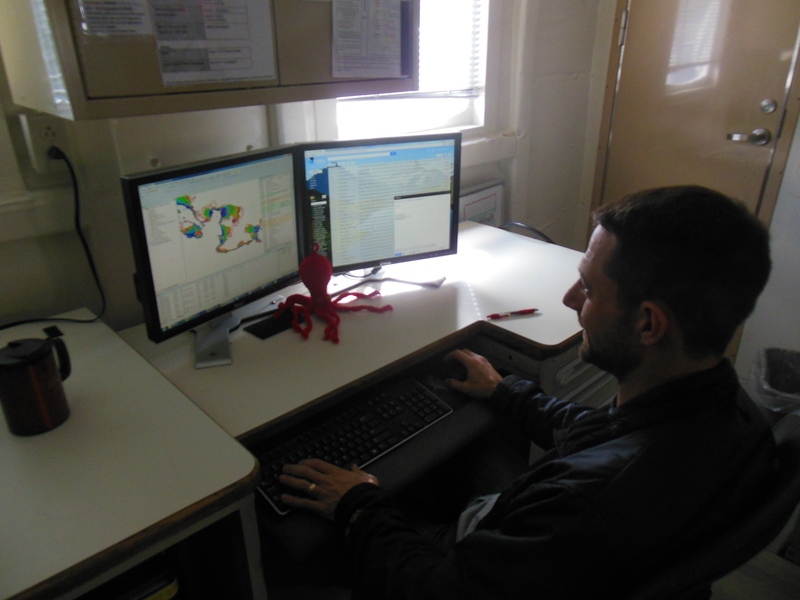 Today’s log is about a software program called CARIS that hydrographers use to plan their project and guide data collection through the season. This morning, Ensign Micki Ream planned her season’s work in the Plot Room on CARIS. This afternoon, she walked out the plot room door and onto the bridge where she navigated Rainier through the narrow Blackney Passage of the Inside Passage. Prior to taking over the bridge, I watched as Ensign Ream as she plotted her project area for the season. 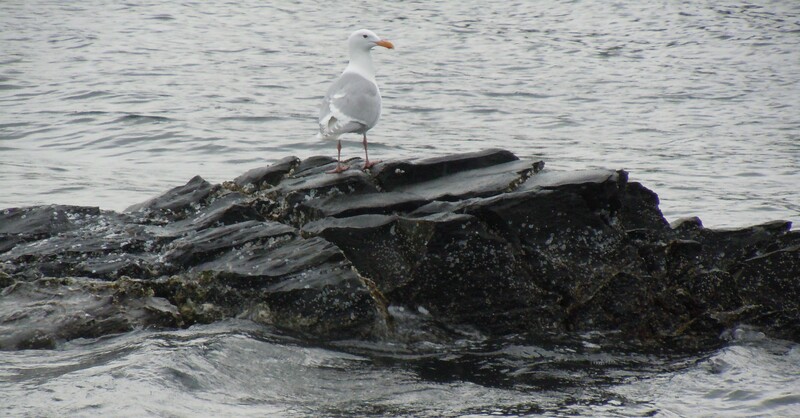 She has been assigned Cape Uganik, an area of North Kodiak Island in the vicinity of Raspberry Island. 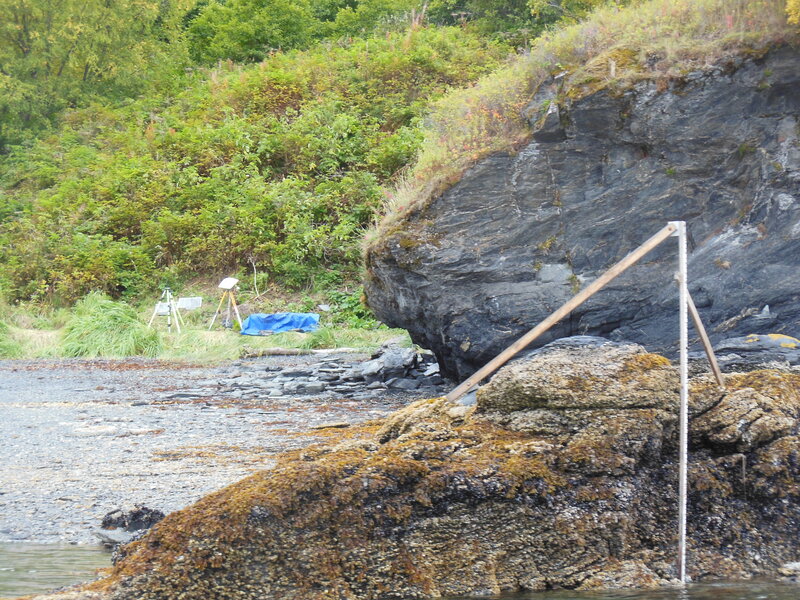 The area was chosen to survey due to boat traffic and because the last survey completed was in 1908 by lead line. Here you can see the original survey report and an image of how data was collect at that time (1908 Survey of Ensign Ream’s Survey Area). Ensign Micki Ream explained that the charts were called “sheets,” because originally, they were sheets of paper, sent out with the surveyor into the field. While we still call them sheets, they are now in electronic form, just like the sheet below representing one of two project areas ENS Ream will most likely work on this summer. Ensign Ream’s task is to break this large polygon into smaller manageable parts. 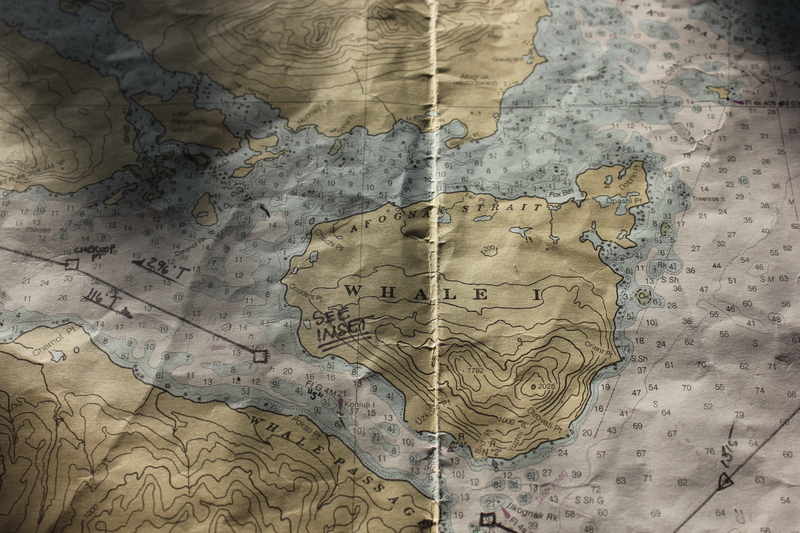 Challenge: print a copy of this map and come up with 30 smaller polygons to assign to your team to survey before you scroll down to see Ensign Ream’s plan. Also, imagine sending several launch boats out into a large area to work without telling them where to go. 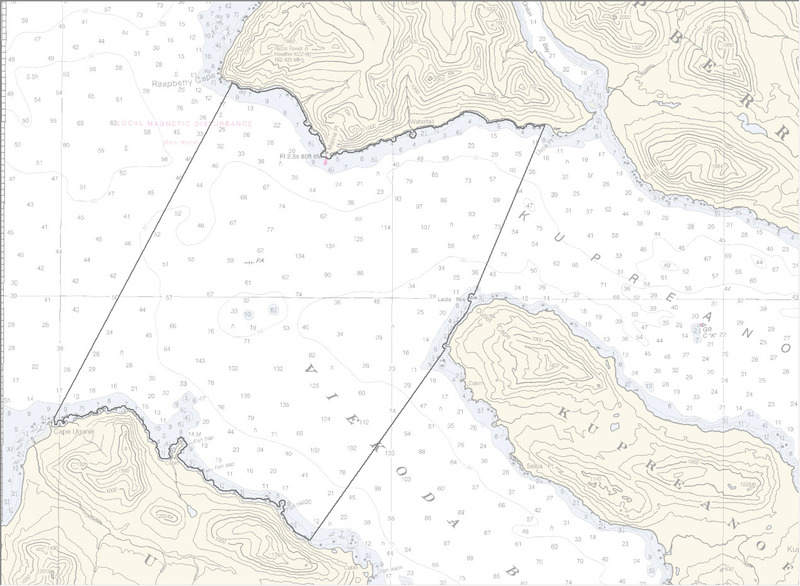 Polygons provide a plan for several boats to work safely in an area without running into each other. It allows areas to be assigned to people based upon their skills. The coxswains, boat drivers, with a lot of experience and skill, will take the near shore polygons, and the newer coxswains will take less hazardous, deeper water. Another reason to break your sheet into polygons is to maintain team moral. By breaking a large task into small assignments people feel a sense of accomplishment. As she divided her large polygon into 30 smaller polygons, Ensign Micki Ream kept in mind many variables. First, she considers the depth of the water. 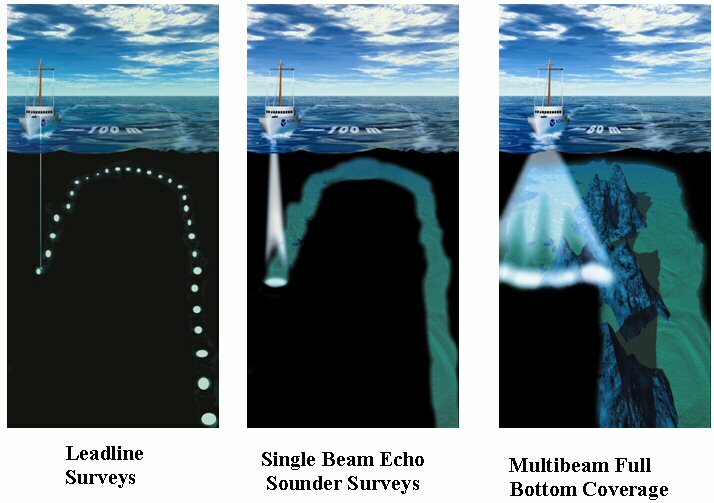 The sonar produces a swath of data as the survey vessel proceeds along its course. As the water gets deeper, the swath gets wider, so you can make a bigger polygon in deeper water. As she drew her polygons, she followed contour lines as much as possible while keeping lines straight. The more like a quadrilateral a polygon is, the easier it is for a boat to cover the area, just like mowing a rectangular lawn. 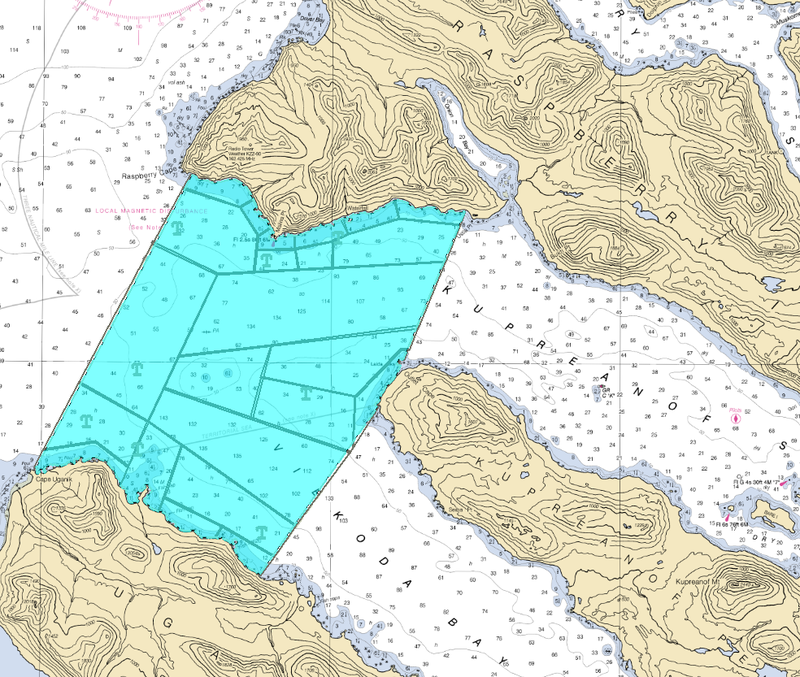 In her polygons, she cut out areas that are blue (shallow), rocky areas and kelp beds, because those areas are hazardous to boats. 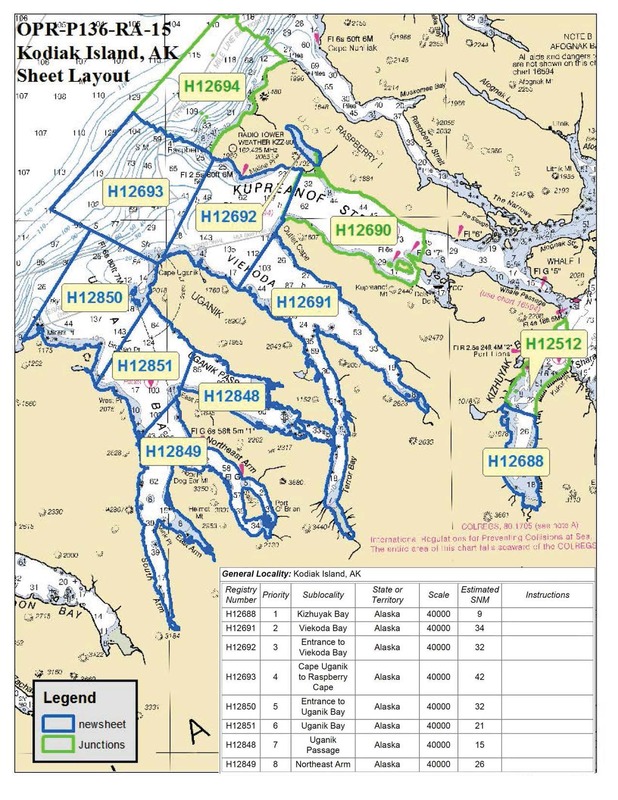 While the hydrographer in charge and coxswain (boat driver), should use best practices and not survey these areas by boat, sometimes they rely on the polygon assignment. Here is Ensign Ream’s Proposal for how to complete this summer’s work. How does it compare to your proposal? Once she has drawn up her plan, Ensign Micki Ream roughly measures the average length and width of her polygons and puts that data into a Polygon Time Log form that a co-worker created on Rainier last season. The form also takes into account the depth and gives an estimate of time it will take to complete the polygon. This Time Log is just one of the many pieces of technology or equipment that crew invents to make their lives and jobs easier. 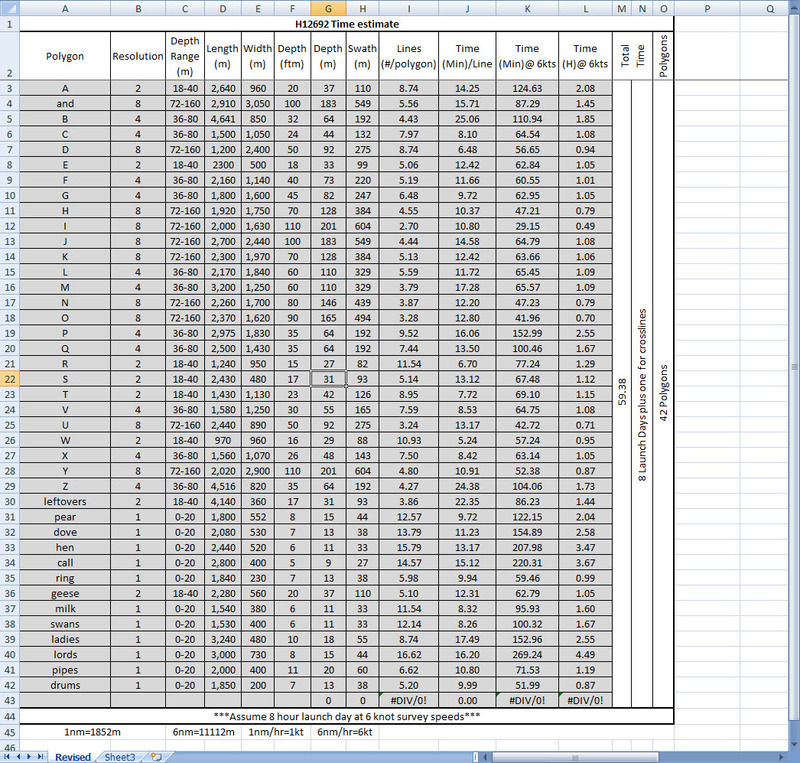 Polygon Time Logs estimate how long it will take to complete a sheet. The fun part of this process is naming your polygons so that hydrographers in the field can report back to you their progress. Traditional alphabetical and numerical labels are often used, but Ensign Micki Ream is naming some of her polygons after ’90s rock bands this year. 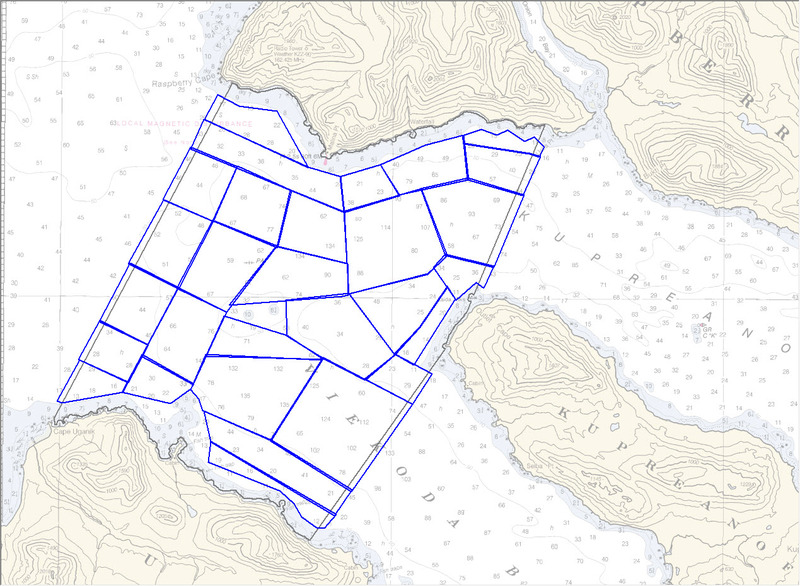 Once the polygon is named, the sheet manager, Ensign Ream, develops a boat sheet for a hydrographer in charge (HIC): this is their assignment for the day. Typically, they send out three to four people on a launch, including the HIC, coxswain and an extra hand. There are always new people aboard Rainier, so there are often other people in the launch being trained. There are enough immersion suits for 4 people but ideally there are three people to help with launching the boat and completing the day’s work. 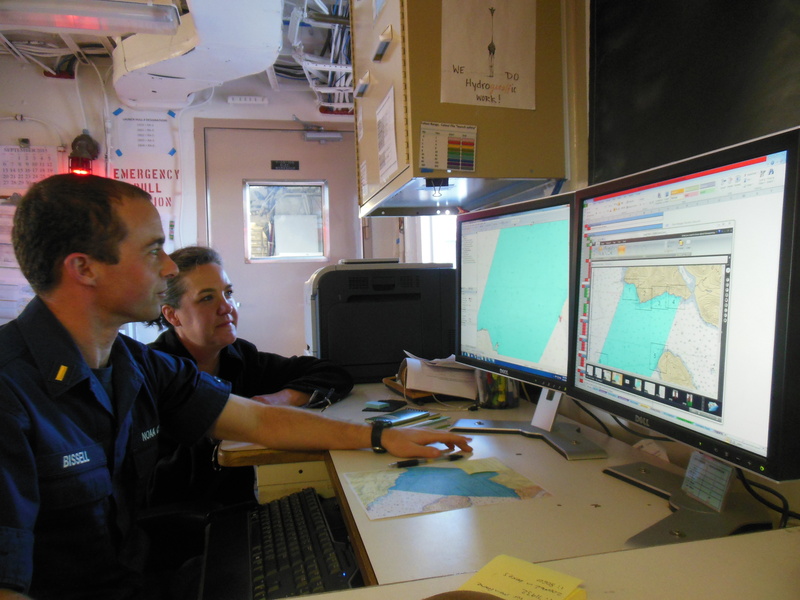 Communication between the HIC and coxswain is essential to get data for ocean depths in all areas of their polygon as they determine the direction to collect data in their work area. 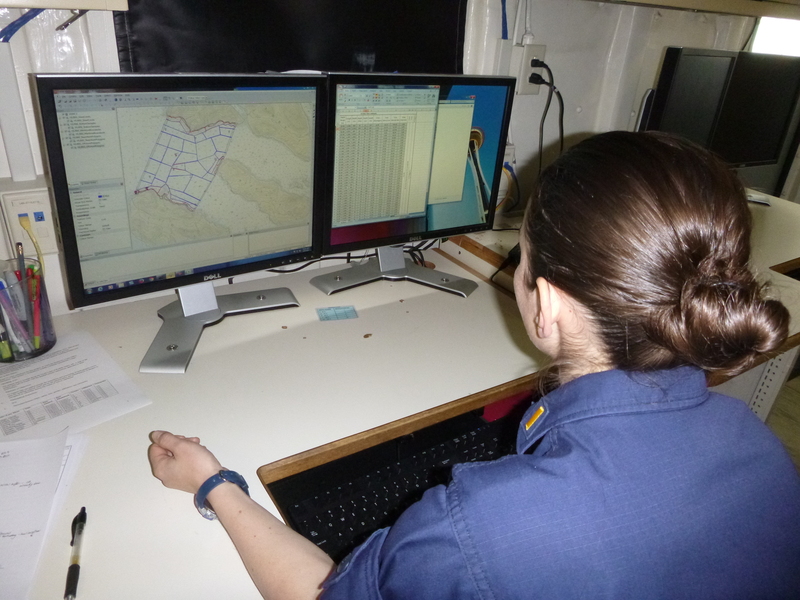 Now, at least, the hydrographer and coxswain know where to start and stop, and are confident that their sheet manager has done her best to send them into a safe area to collect the data needed to make new charts. Since Ensign Ream’s polygon plan is an estimate, the time to complete each polygon may be longer or shorter than estimated. 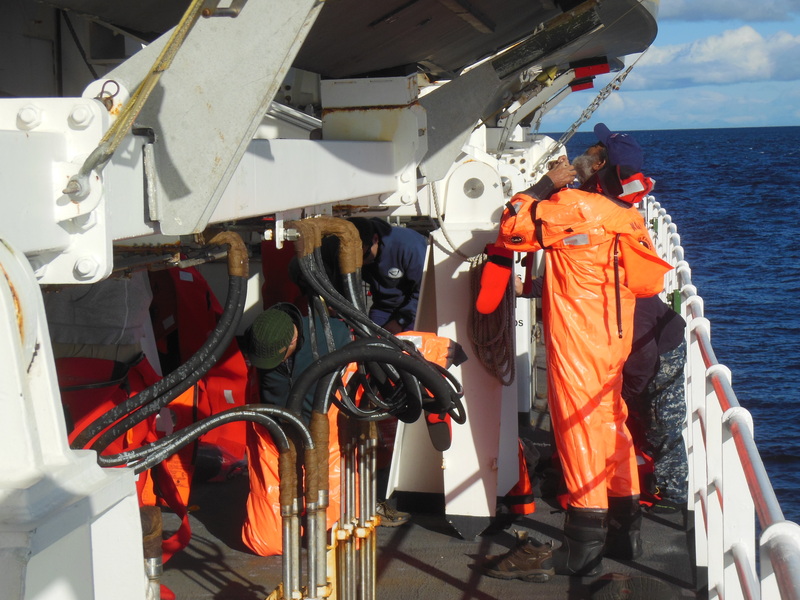 Variables such as the constantly changing depth of the ocean, weather, experience and equipment of the crew collecting data, and a myriad of other variables, known and unknown, make scheduling and completing surveys a constantly moving target. There are two guarantees however: flexibility is required to work on the crew and ultimately winter will force a pause to Rainier’s work. Although I have been on Rainier for only several days, I am blown away by the incredible skills crew members acquire in short amounts of time. 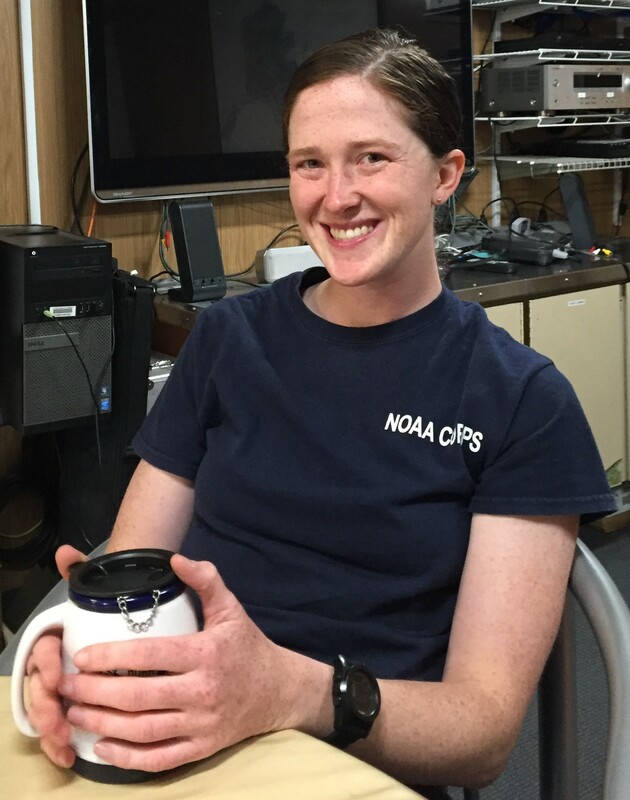 Ensign Micki Ream is the perfect example: In January, 2013, she joined the NOAA Corps which provides operational support for NOAA’s scientific missions. 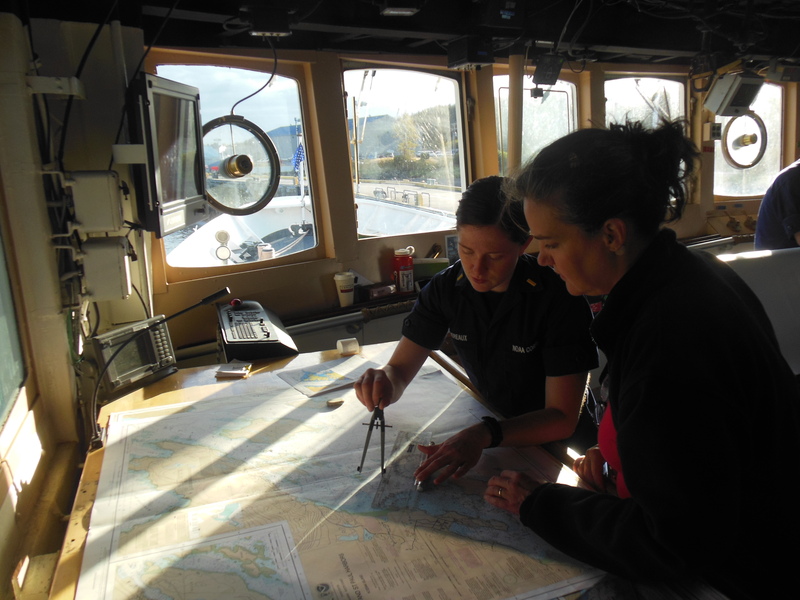 During a six month officer training, she was trained in the basics of navigation. On June 2, 2013, she joined Rainier crew. 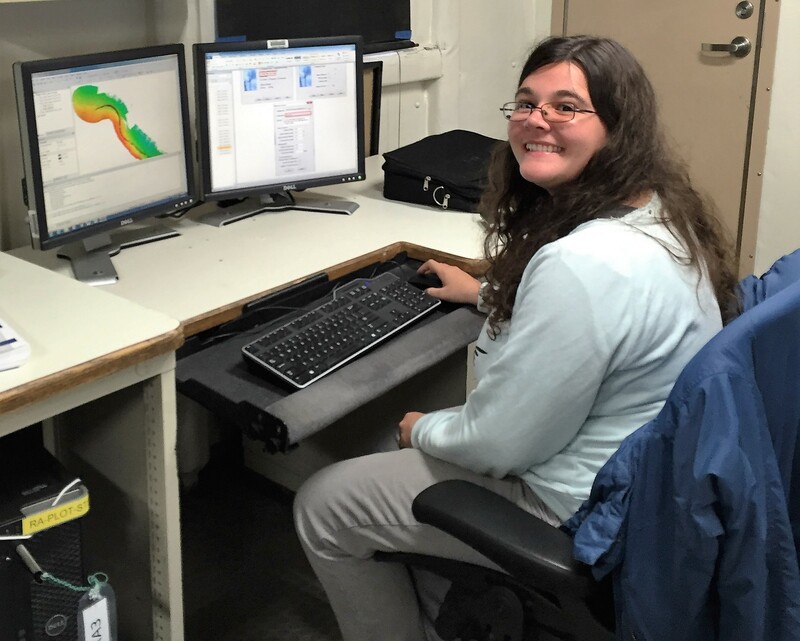 In February, 2014 NOAA sent her to a one month Basic Hydrography School where she learned hydrography principles and how to use various software programs. 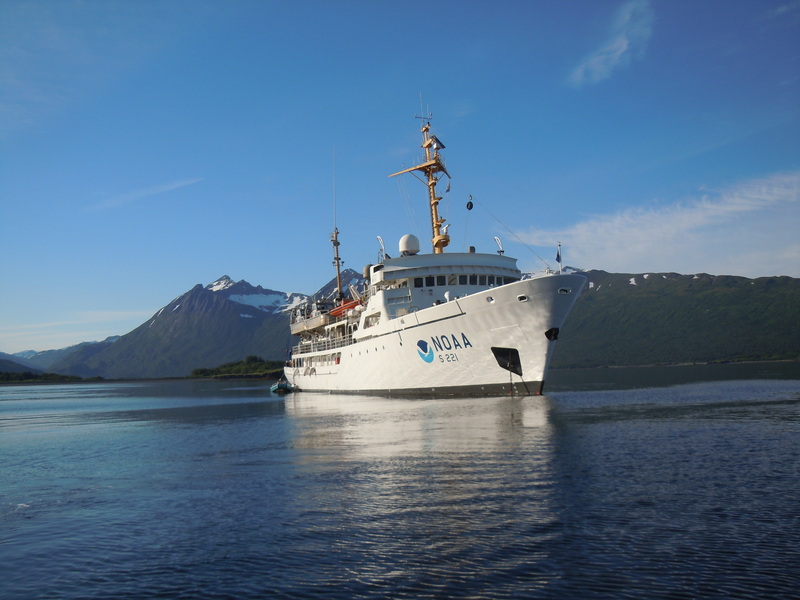 Throughout her short time at NOAA, she has had significant and varied on the job training with scientific, managerial and navigational work.The rest of her skills are on the job training with an end goal of Officer of the Deck (similar to a mate in commercial sailing) and Hydrographer in Charge. Here, Ensign Ream is modifying polygon names from 90’s rock bands to the 12 Days of Christmas. There is plenty of room for creativity! 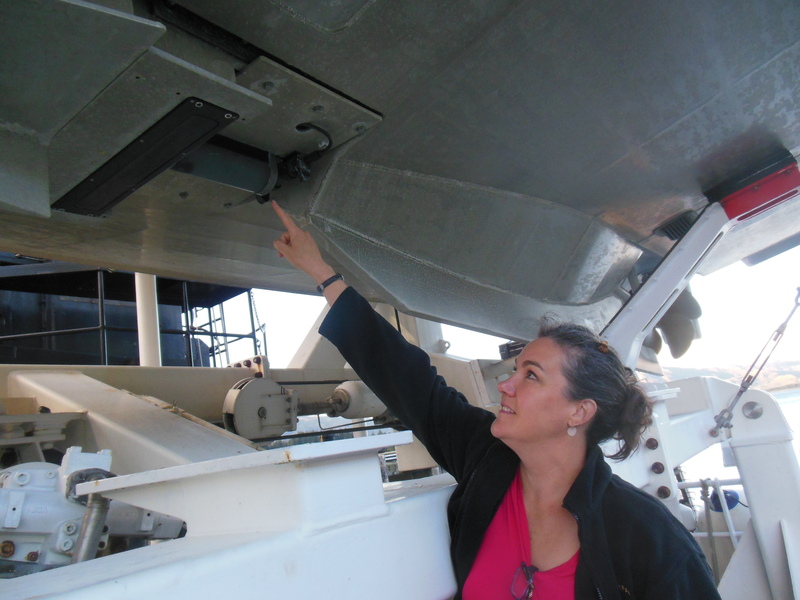 Ensign Micki Ream does have a background in science which she is putting to use every day. 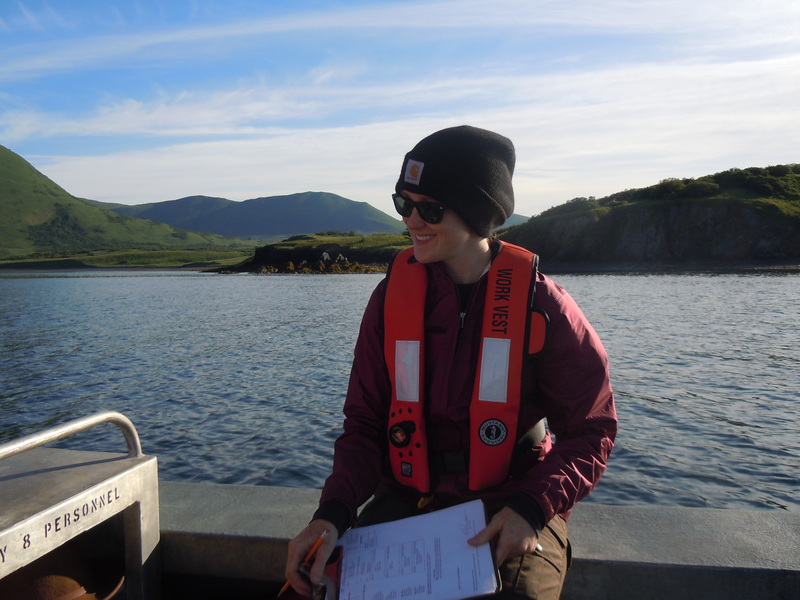 Originally from Seattle, she started her career with NOAA in June, 2009, after obtaining a Marine Biology degree at Stanford University. 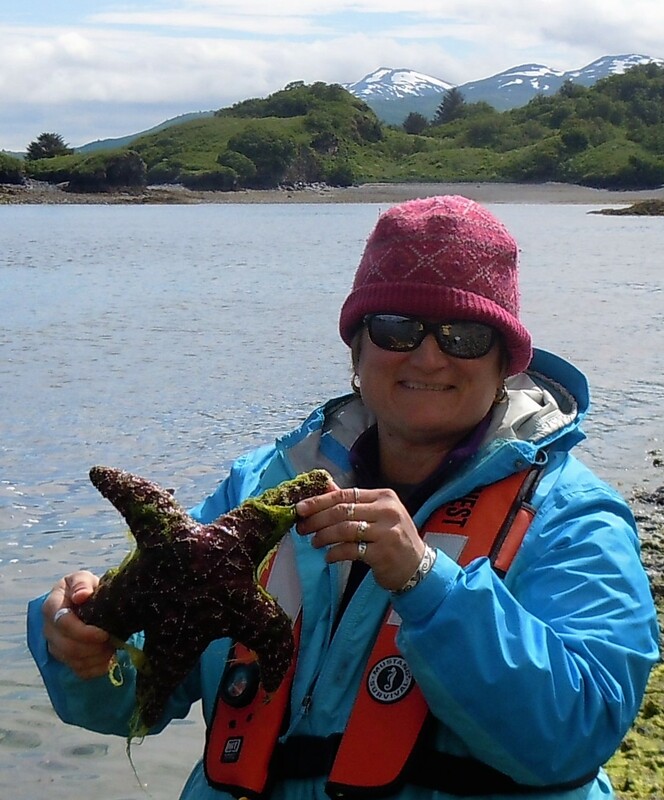 Her first position was with the Office of National Marine Sanctuaries Program, which provided her with an internship and scholarship to acquire a Master’s Degree, also from Stanford, in Communicating Ocean Science. 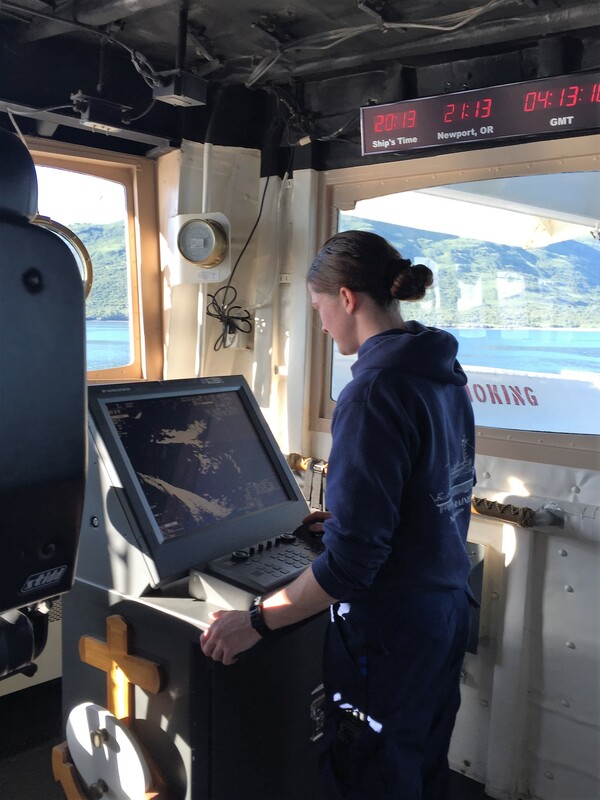 Just a little over one year after coming to NOAA Corps, she is a hydrographer in training and safely navigating a very impressive ship as part of a bridge team, including highly skilled navigational experts such as Ensign J.C. Clark and Commander Brennan. 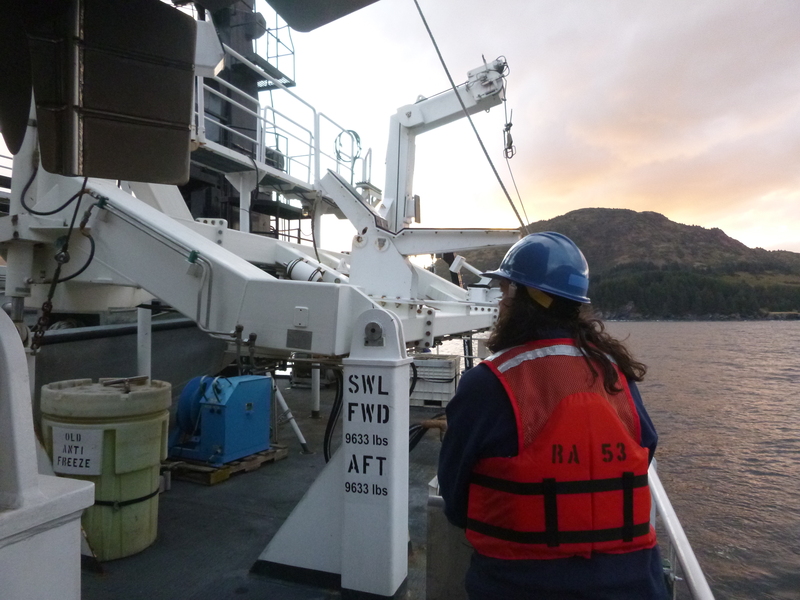 Where else could you get training, experience and on the job support in so many diverse areas but with NOAA Hydro? 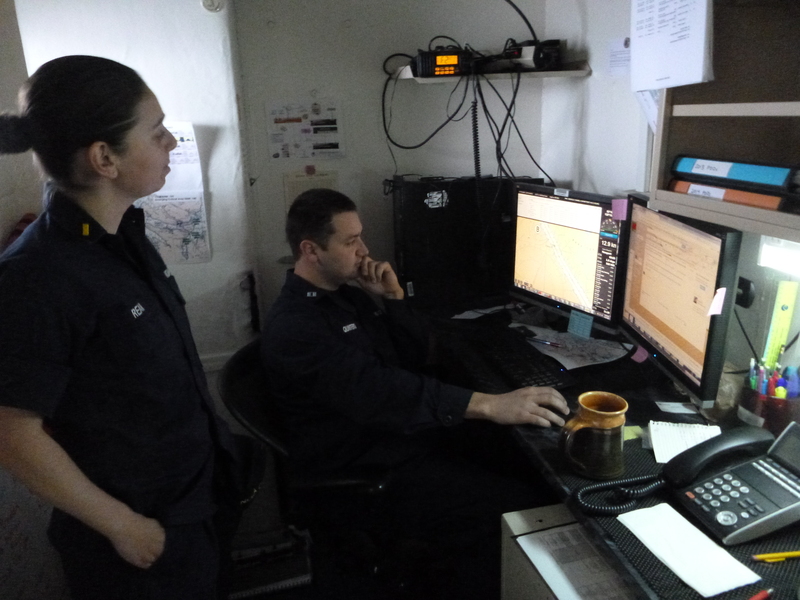 Ensign Ream consults with Lieutenant Russel Quintero, the Field Operations Officer, about the best way to navigate through a narrow passage during her upcoming bridge watch. The food is absolutely amazing on board. Tonight’s dinner options were roast prime beef, cut to order, au jus, creamy smoked salmon casserole, farro vegetable casserole, baked potatoes with fixings, asparagus and several different kinds of cake and fruit. 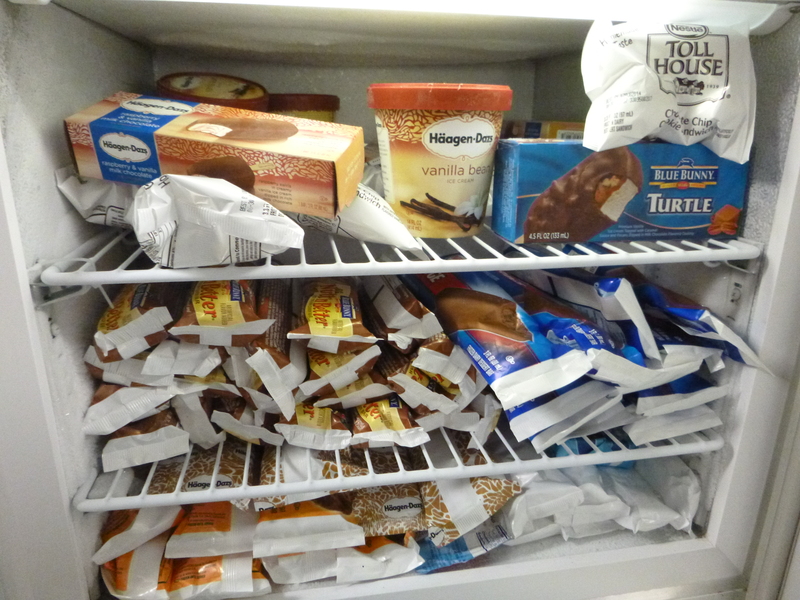 In the evenings, snacks are also available. My biggest challenge has been to pace myself with the the quantity of food I eat, particularly since taking long hikes after dinner is not an option. 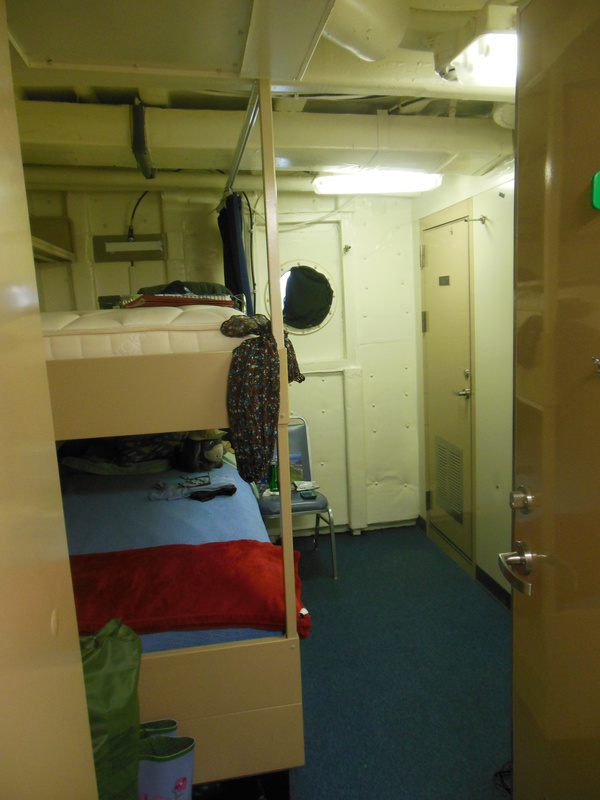 I feel very well cared for aboard Rainier. As you can see from my weather data section, the wind speed this morning was up to 42.65 knots. We had waves near 18 feet and thus the Oscar Dyson ran for cover and tucked itself in an inlet on the North side of Kodiak Island called Spiridon Bay. 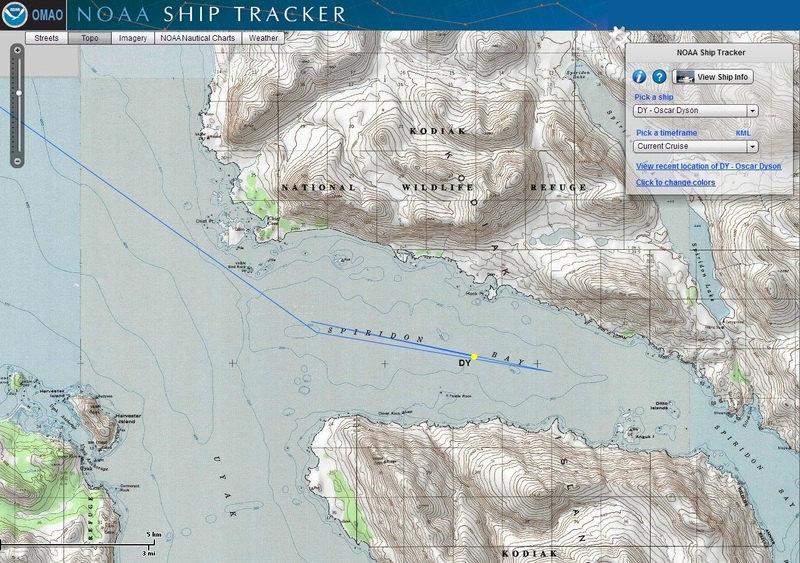 The Oscar Dyson’s location can be viewed in near real-time using NOAA’s Shiptracker website. 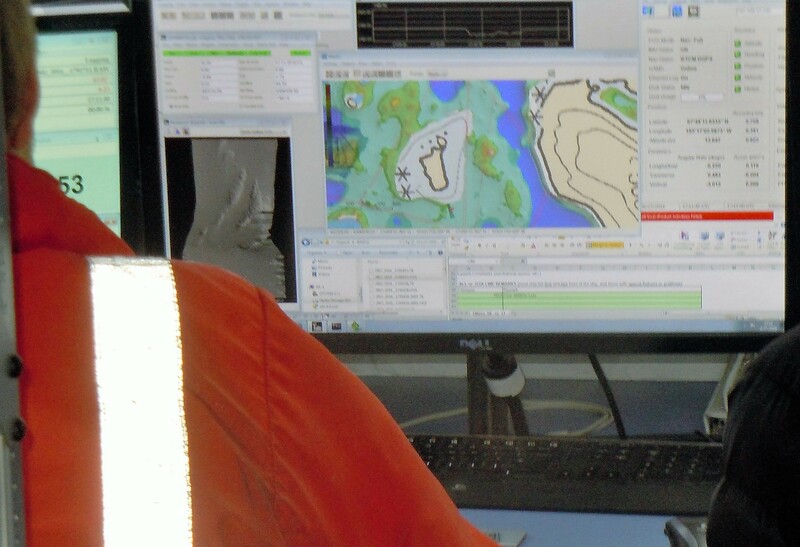 The screenshot above was taken from the Shiptracker website when we were hiding from the weather. 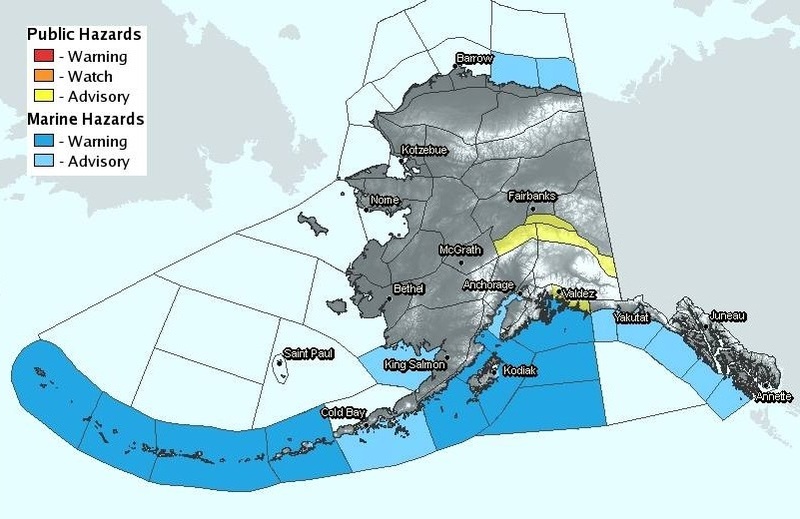 The weather forecast from NOAA’s Alaska Region Headquarters shows that the winds should diminish over the next few days. I’m thankful to hear that! …GALE WARNING TONIGHT….TONIGHT…S WIND 45 KT DIMINISHING TO 35 KT TOWARDS MORNING. SEAS 23FT. PATCHY FOG..SAT…SW WIND 30 KT DIMINISHING TO 20 KT IN THE AFTERNOON. SEAS15 FT. PATCHY FOG..SAT NIGHT…W WIND 15 TO 25 KT. SEAS 8 FT. RAIN..SUN…SW WIND 20 KT. SEAS 8 FT..SUN NIGHT…S WIND 25 KT. SEAS 8 FT..MON…SE WIND 25 KT. SEAS 13 FT..TUE…S WIND 30 KT. SEAS 11 FT..WED…S WIND 25 KT. SEAS 9 FT. 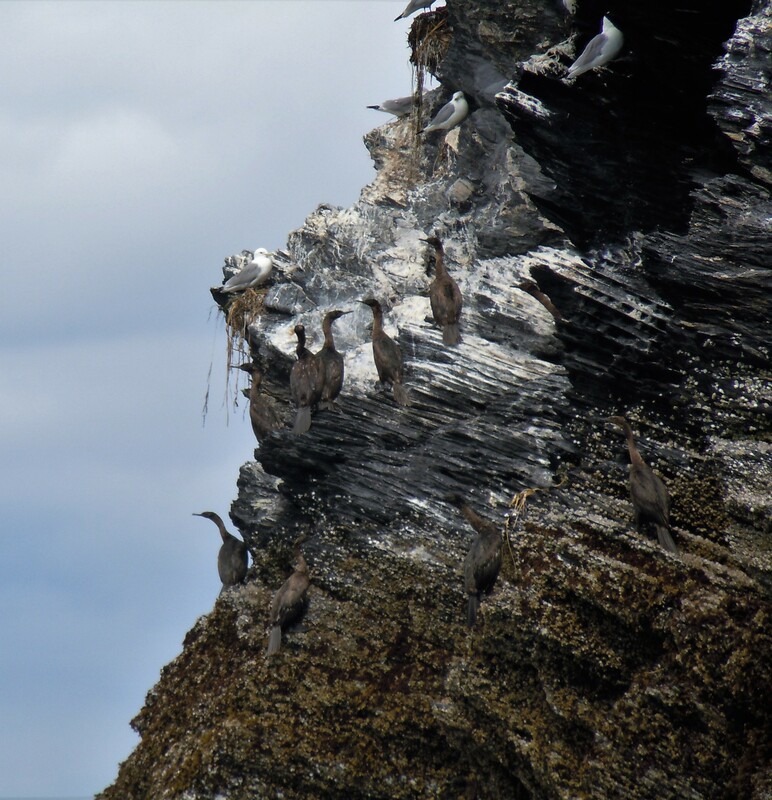 Since the Dyson has been in safe harbor in Spiridon Bay for the last few hours, I have had some time to catch up on some blogging! Let’s backtrack a few days to Wednesday, September 4th, when the Dyson left Kodiak to begin its journey in the Gulf of Alaska. We headed out after 1PM to pick up where the last cruise left off in the research grid. We reached our first station later in the afternoon and began work. 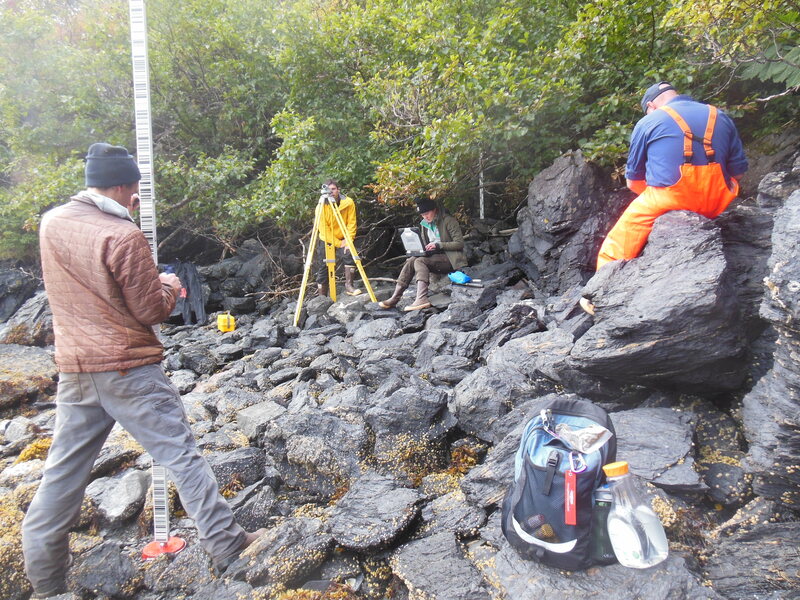 A station is a pre-determined location where we complete two of our surveys (see map below). The circles on the map represent a station location in the survey grid. The solid circles are from leg 1 of the cruise that took place in August and the hollow circles represent leg 2 of the cruise, which is the leg on which I am sailing. 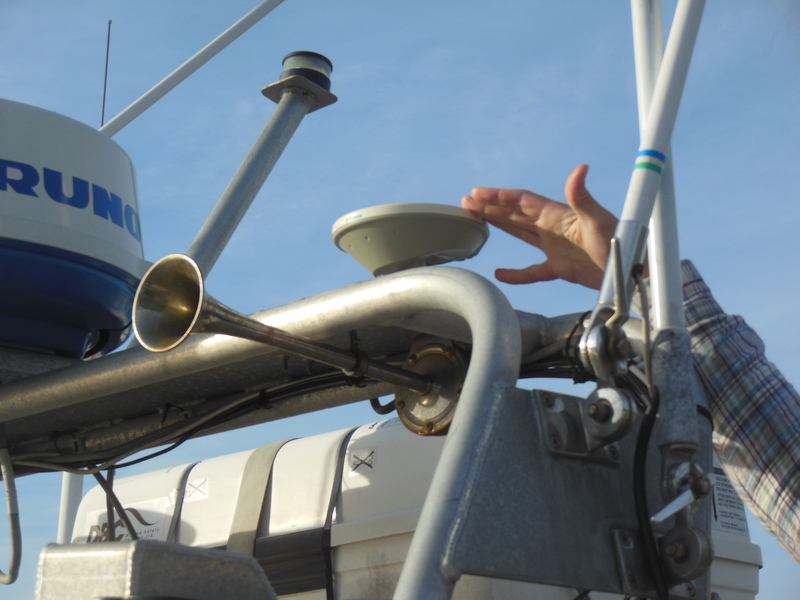 The first step once we reach a station is to deploy a Bongo net to collect marine zooplankton and the second step is to begin trawling with an anchovy net to capture small, pelagic juvenile pollock and forage fishes that are part of the main study for this cruise. Pelagic fish live near the surface of the water or in the water column, but not near the bottom or close to the shore. Zooplankton are “animal plankton”. The generic definition of plankton is: small, floating or somewhat motile (able to move on their own) organisms that live in a body of water. Some zooplankton are the larval (beginning) stages of crabs, worms, or shellfish. Other types of zooplankton stay in the planktonic stage for the entirety of their lives. In other words, they don’t “grow up” to become something like a shrimp or crab. 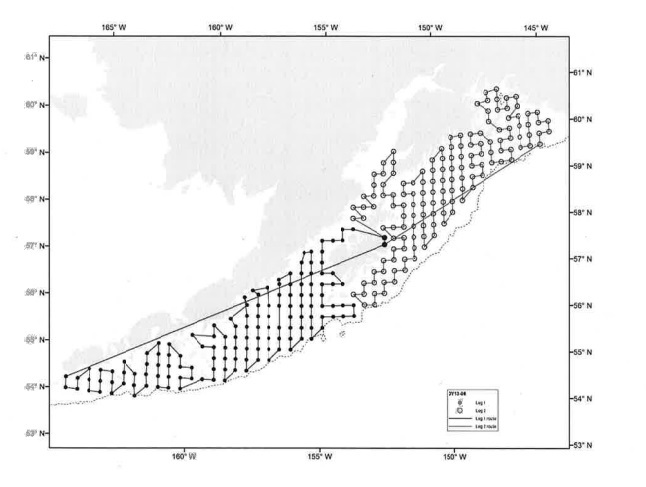 Station map for leg 1 and leg 2 of the juvenile pollock survey. I am on leg 2 of the survey, which is represented with hollow circles on the map. Before we reached the first station, we conducted a few safety drills. The first was a fire drill and the second was an abandon ship drill. The purpose of these drills is to make sure we understand where to go (muster) in case of an emergency. For the abandon ship drill, we had to grab our survival suits and life preservers and muster on the back deck. The life rafts are stored one deck above and would be lowered to the fantail (rear deck of the ship) in the event of an actual emergency. 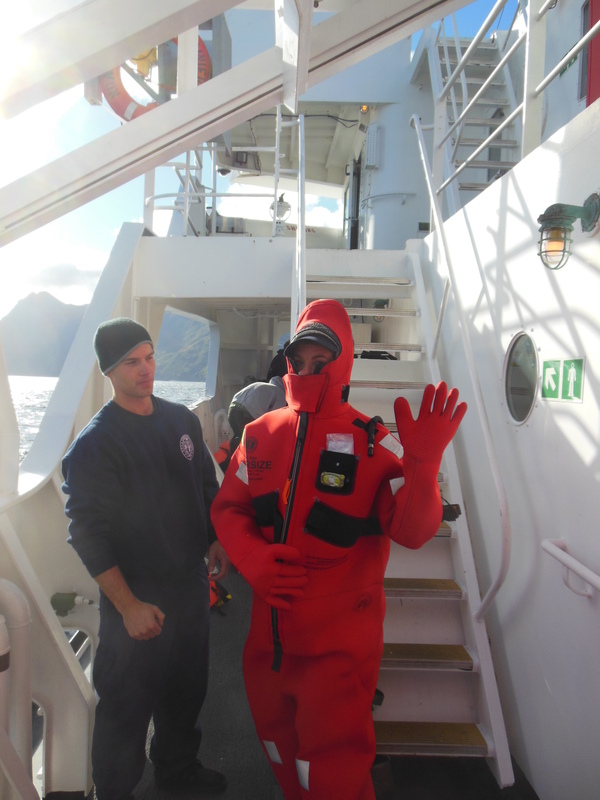 After the drill I had to test out my survival suit to make sure I knew how to put it on correctly. 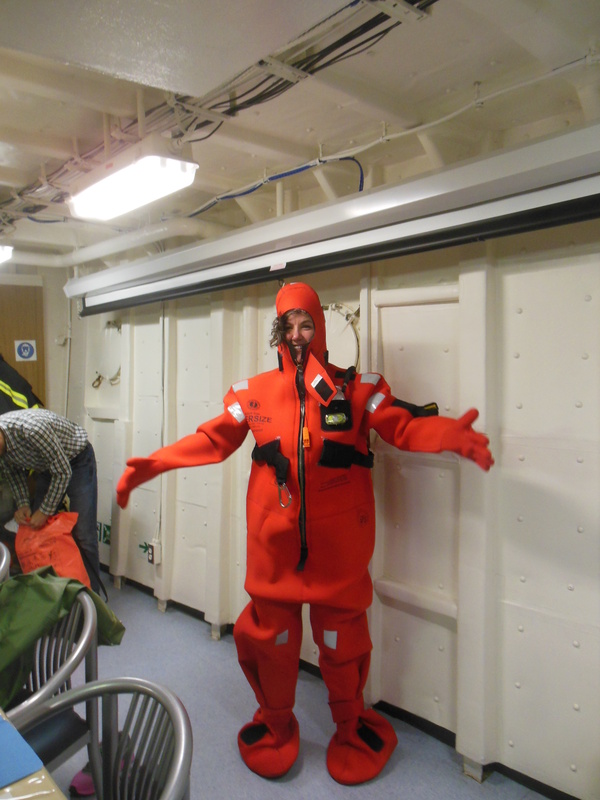 Britta models a survival suit – they even found a size SMALL for me! 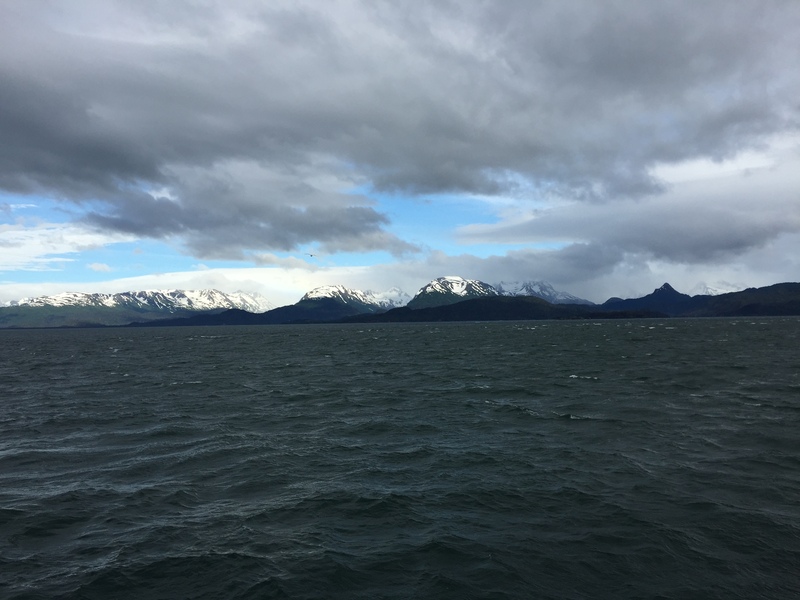 On the way to our first station, we traveled through Whale Pass next to Whale Island, which lies off of the northern end of Kodiak Island. While passing through this area, we saw a total of 4 whales spouting and so many sea otters, I lost track after I counted 20. Unfortunately, none of my pictures really captured the moment. The boat was moving too fast to get the sea otters before they flipped over or were out of sight. Last night’s warning about high seas in the early morning of September 6th. A lot of people have emailed to ask me if I have been getting seasick. So far, things haven’t been that bad, but I figured out that I feel pretty fine when I’m working and moving about the ship. However, when I sit and type at a computer and focus my attention on the screen that seems to be when the seasickness hits. For the most part, getting some fresh air and eating dried ginger has saved me from getting sick and fortunately, I knew about the threat of high winds last night, so I made sure to take some seasickness medication before going to bed. After what we experienced this morning, I am sure glad I took some medication. Everyone on board seems very friendly and always asks how I am doing. It has been a real pleasure to meet the engineers, fisherman, NOAA Corps officers, scientists, and all others aboard the ship. Since we have to work with the crew to get our research done, it’s wonderful to have a positive relationship with the various crew members. 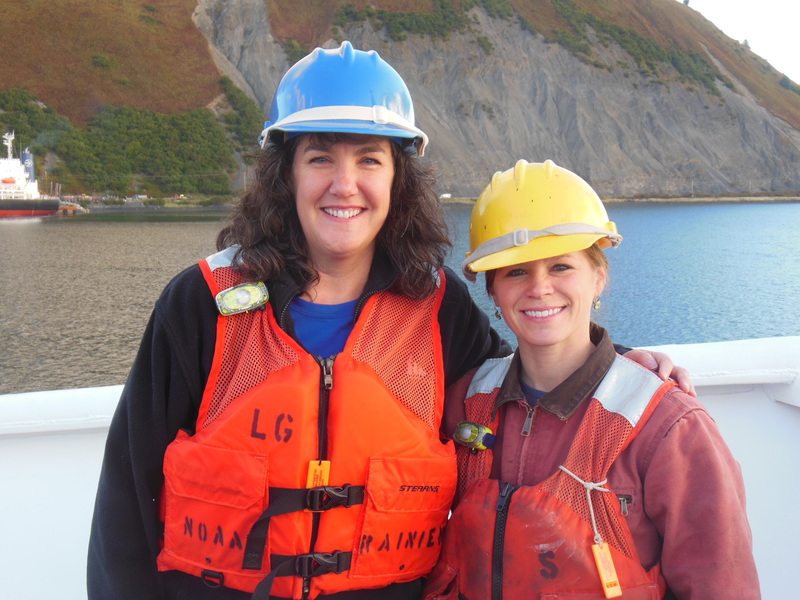 Plus, I’m learning a lot about what kinds of careers one can have aboard a ship, in addition to being a scientist. So far, I’ve worked two 12-hour shifts and even though I’m pretty tired after my long travel day and the adjustment from the Eastern Time Zone to the Alaskan Time Zone (a four hour difference), I’m having a great time! I really enjoy getting my hands dirty (or fishy) and processing the fish that we bring in from the trawl net. Processing the haul involves identifying, sorting, counting, measuring the length, and freezing some of the catch. 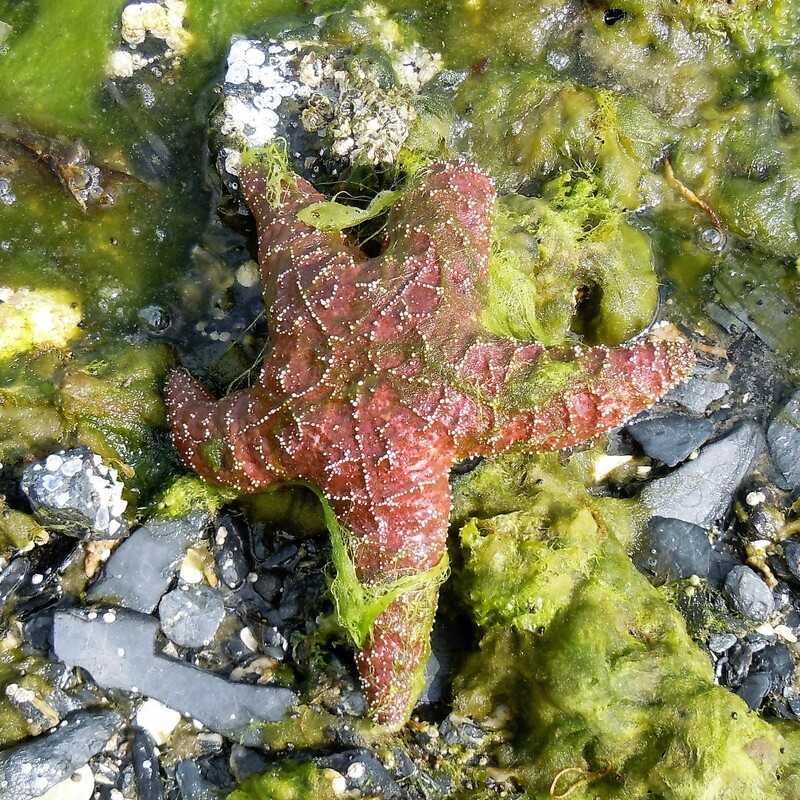 The catch is mainly composed of different types of fish like pollock and eulachon, but sometimes there are squid, shrimp, and jellyfish as well. One of the hardest parts of the trip so far is getting used to starting work at noon and working until midnight. We have predetermined lunch and dinner times, 11:30 AM and 5:00 PM respectively, so I basically eat lunch for breakfast and dinner for lunch and then I snack a little before I go to bed after my shift ends at midnight. As the days go by, I’m sure I’ll get more used to the schedule. During one of our trawls, we found a lanternfish. Lanternfish have rows of photophores along the length of their bodies. Photophores produce bioluminescence and are used for signaling in deep, dark waters. The fish can control the amount of light that the photophores produce. Lanternfish belong to the Family Myctophidae and are “one of the most abundant and diverse of all oceanic fish families” (NOAA Ocean Explorer). 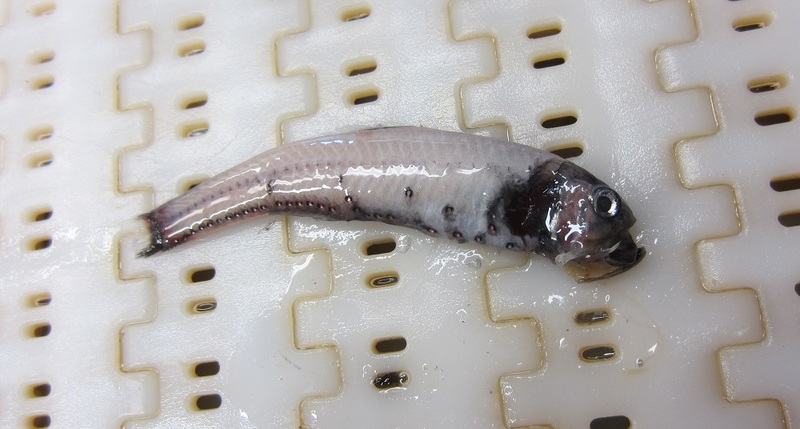 Lanternfish caught during a trawl. 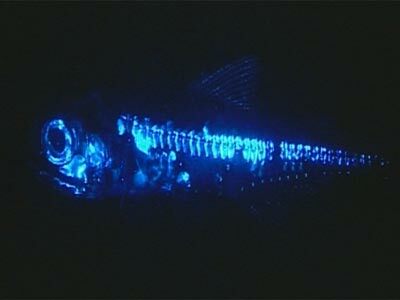 Note the dots along the bottom of the fish, these are photophores that emit bioluminescence.